Old Mother Hubbard got some cupboards! 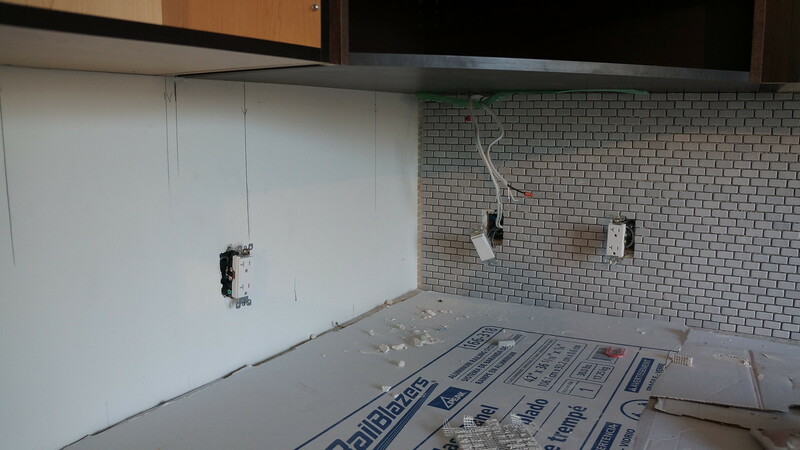 Prepping for Tiles and…. Spring! The roof, the roof, the roof is ON….! From the Windows to the … Doors! 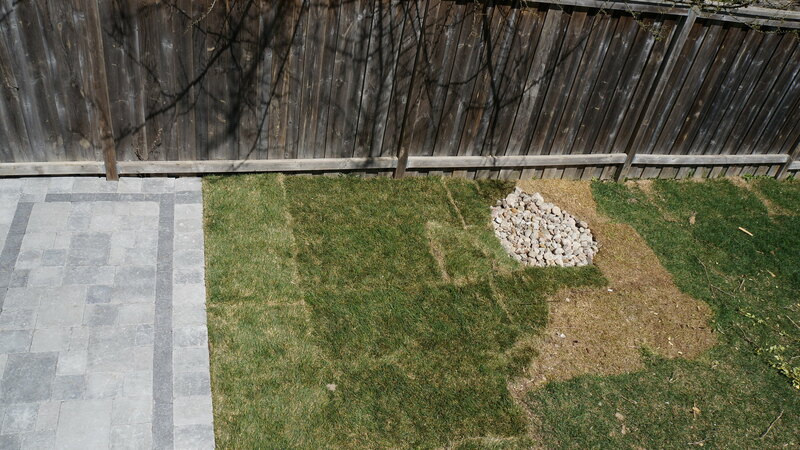 Spring is slowly coming around, and we have started what I expect to be a long landscaping process. We were lucky and tossed down some sod in the fall which survived through the winter, despite a pesky raccoon that would pull up the sod to get at the grubs underneath. 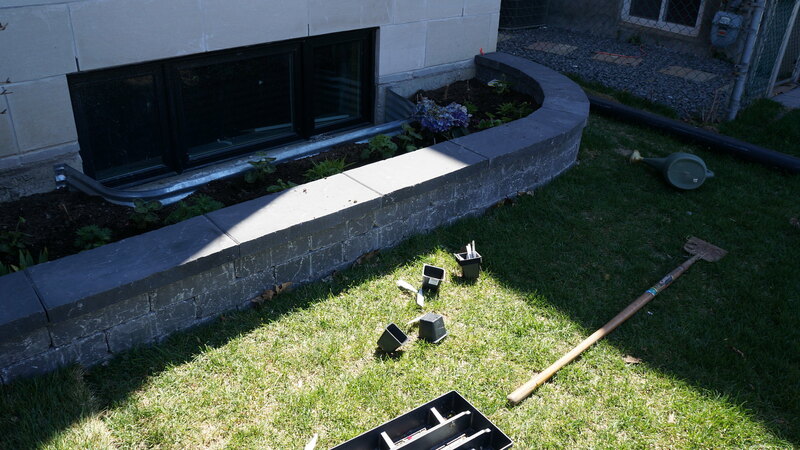 Now it is time for some of the hardscaping. 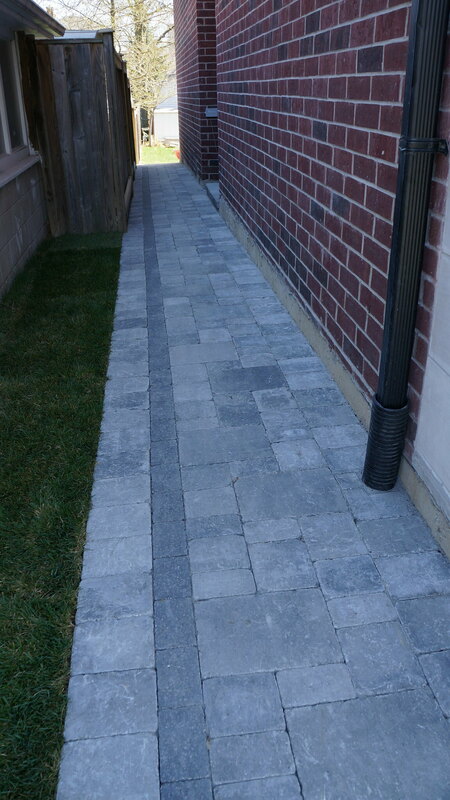 We went with interlocking stone in a grey mix with a dark grey mix trim. 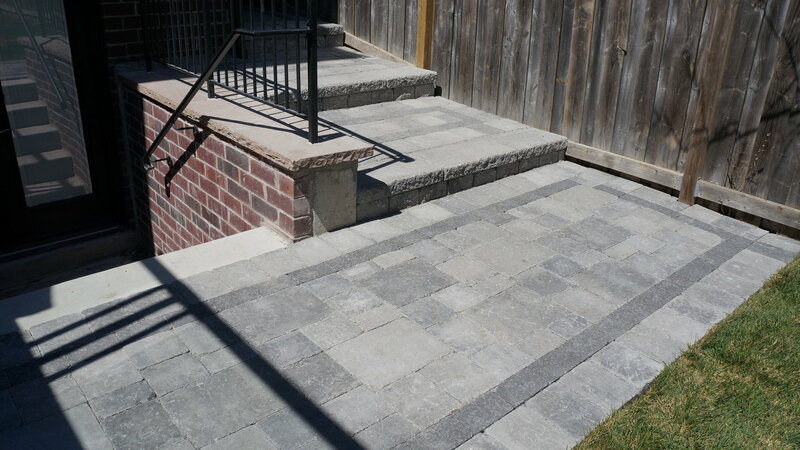 The stone has a tumbled look and we chose a random interlocking pattern. 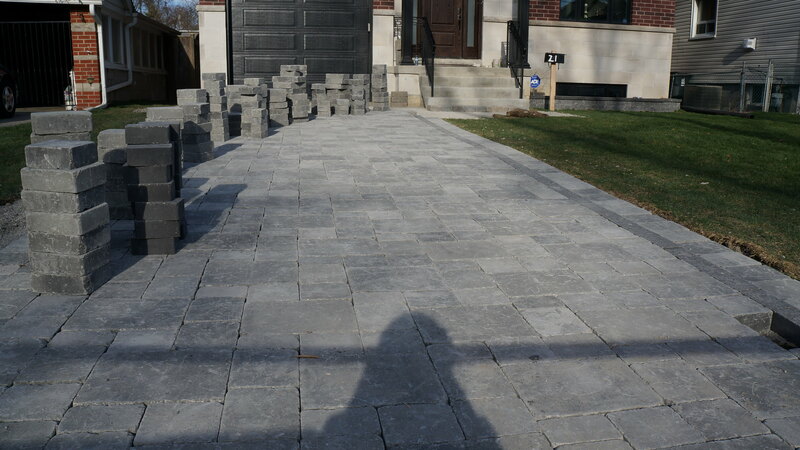 As always, April brought strange weather in Toronto and we had to wait a while before we began, but eventually our stone was delivered. They took about a week and a half to get all the stones laid out. 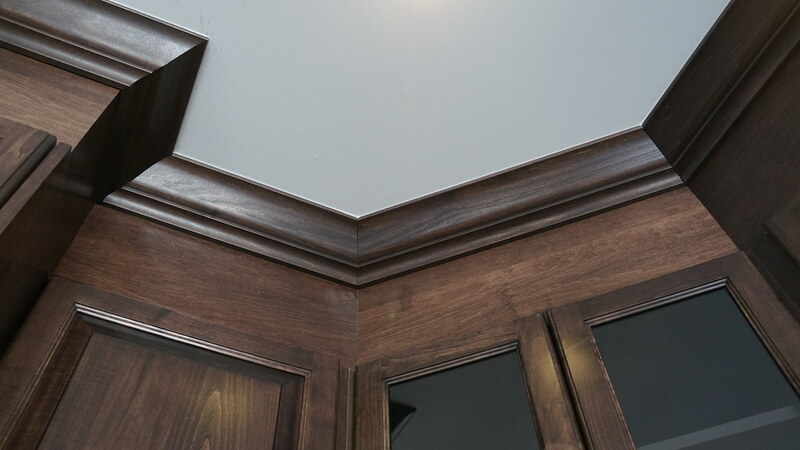 I love how the trim goes all along the edges in a continuous way. 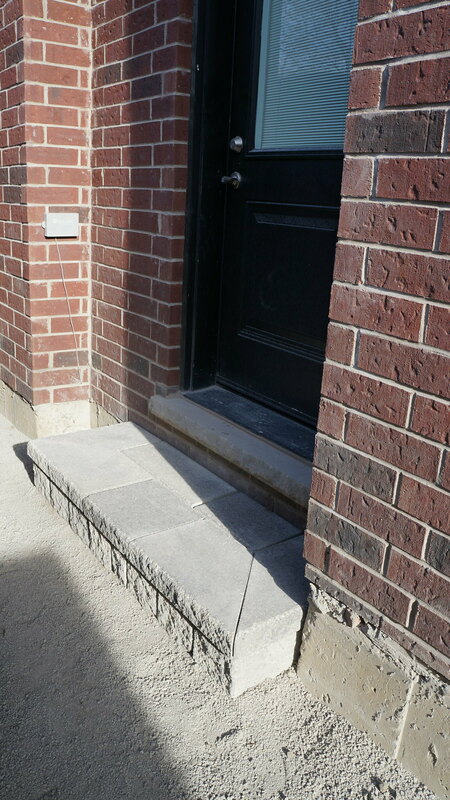 When it curves around the front steps and the the side of the house it looks beautiful. 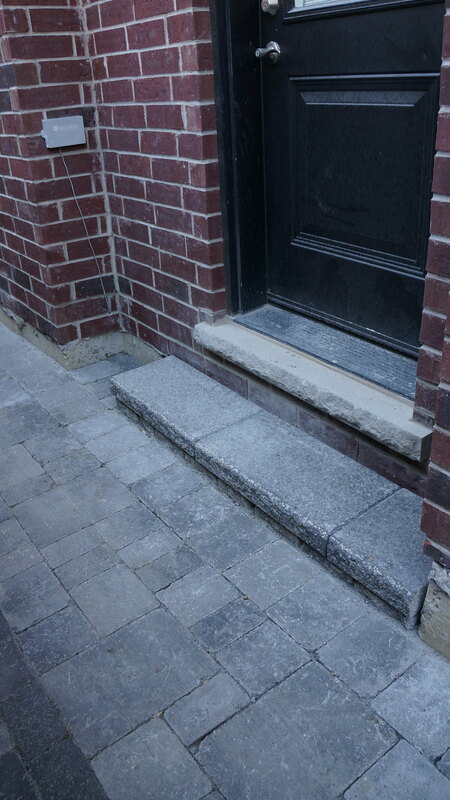 We got a matching grey colour for the side entry stair. 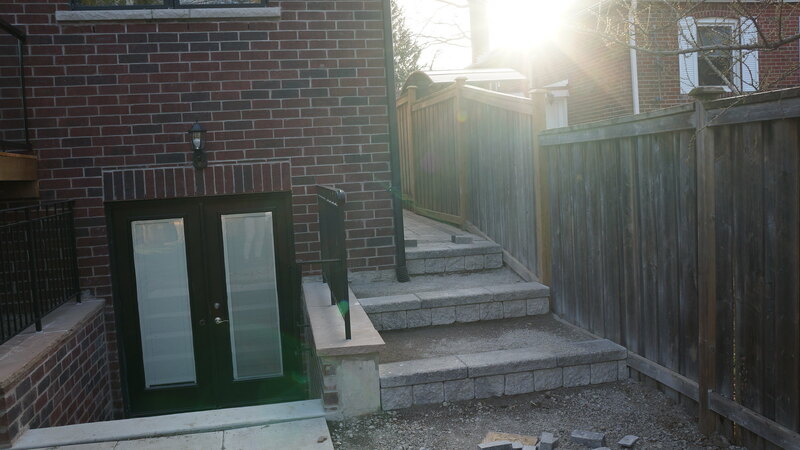 Originally the stair was a bit wider but since we will have to cart bikes and lawnmowers up the side, we made it smaller for convenience. 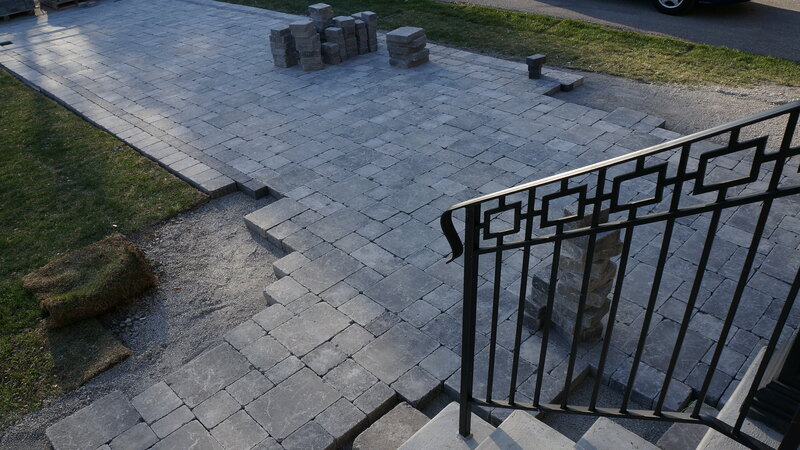 The interlocking goes all the way up the north side of the house. 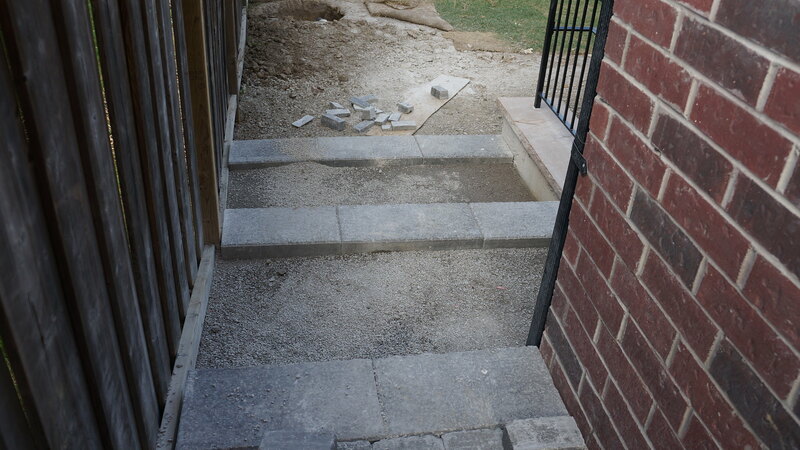 With the change in grading we created steps along the side. 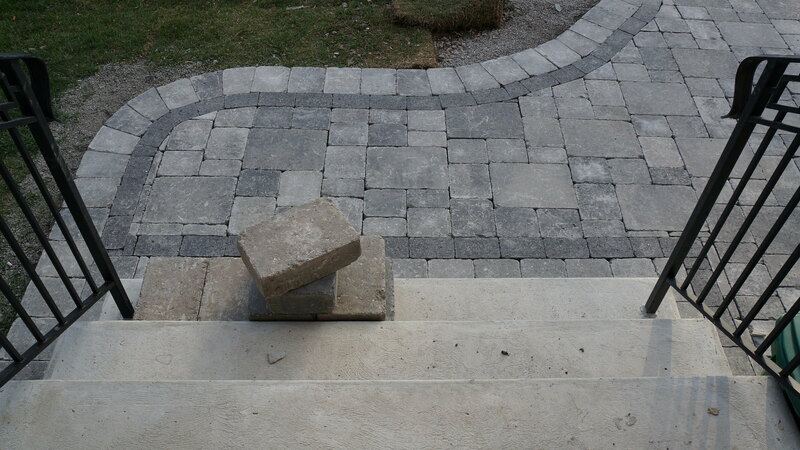 We also decided to bury the downspout so it didn’t have to sit on top of our interlocking stone. It funnels into a swale, except it’s not really a swale, it’s just a little hole for the water to drain back into the soil. 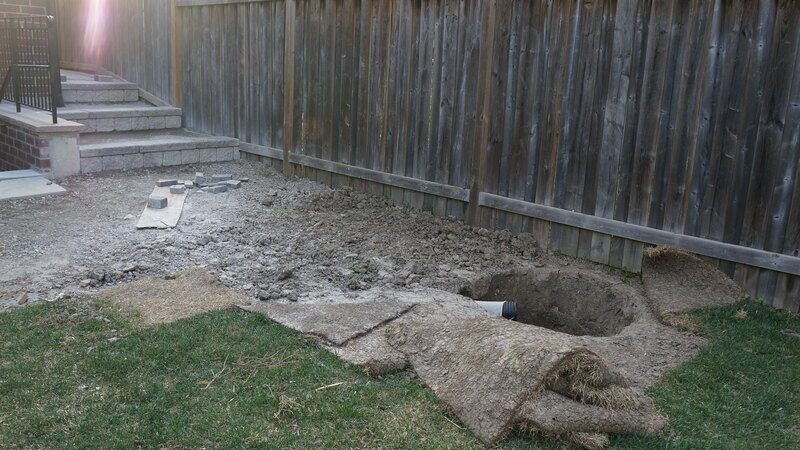 I hope to do some landscaping around the hole, which we filled with river rock. 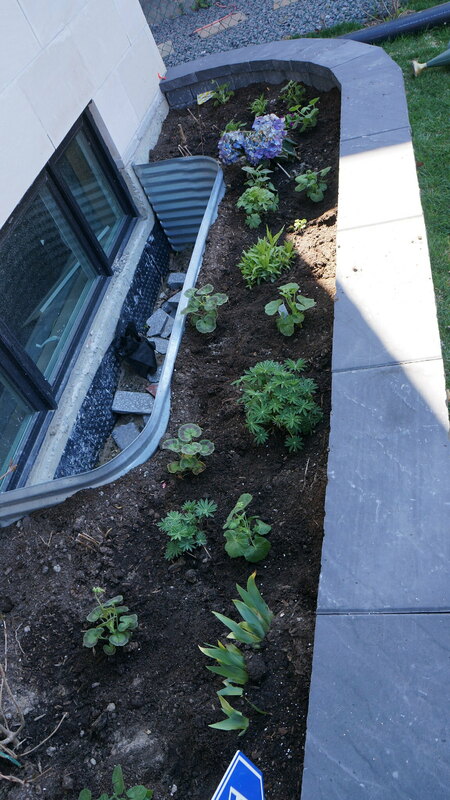 I am thinking a natural looking patch of landscaping to blend into grass, wild flowers and other native plants. Mark’s nona is big on gardening, and she was ready to share some of her many plants. I have no idea what I’m doing with gardening; since Mark is well seasoned, he is showing me the ropes. He planted his grandmother’s flowers and they have been taking off. I’m sure there will be more to come. Next up will be building a wooden fence along the south side and back of the yard to replace the chain link fence. I plan to rejuvenate the existing wooden fence on the north side and then stain everything. In preparation of that, Mark started to hack away some branches and bushes that will need to be removed to put in fence posts. 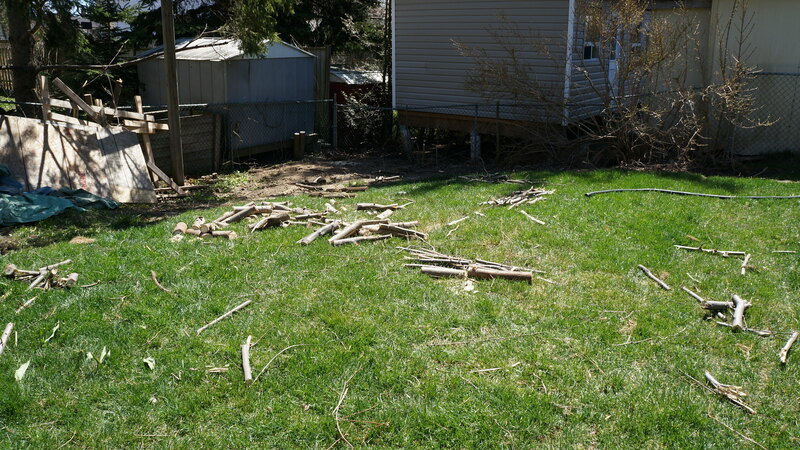 The stumps will also need to be removed and we scheduled locates for our gas lines etc. so we don’t accidentally hit anything while building our fence posts. 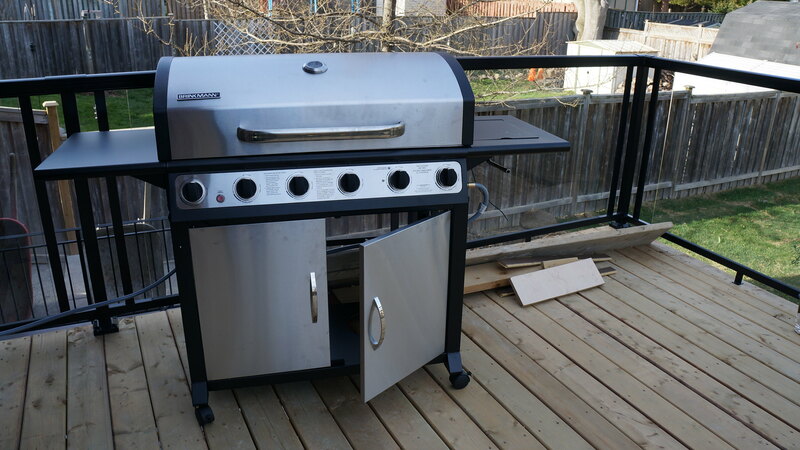 Now that we have a deck and what feels like a backyard (we have yet to get patio furniture) we put together a BBQ Mark’s parents gifted to us and have put it to good use. Last summer, we came across this little guy. 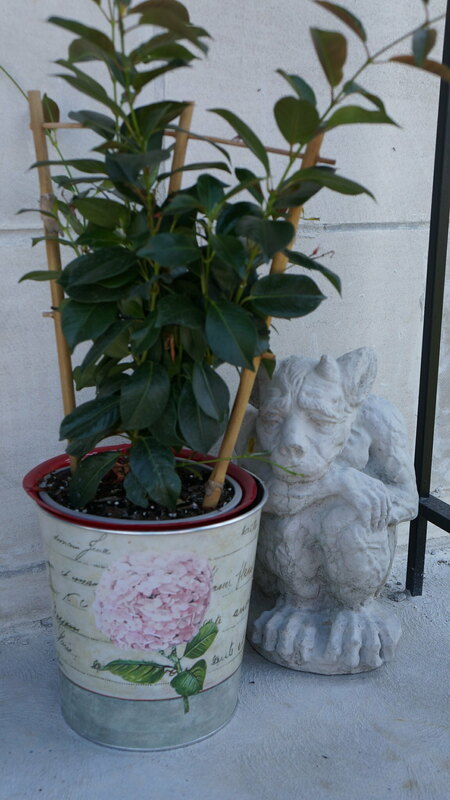 We found in him Detroit at the farmers market and he has been doing a great job guarding our front door. 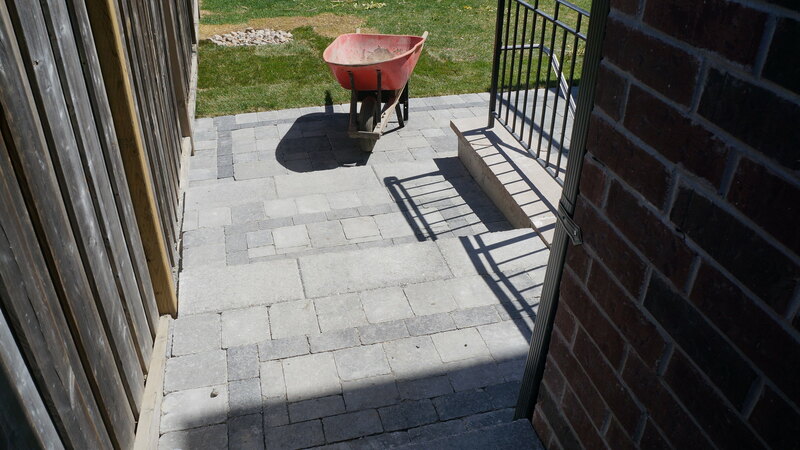 Now that we have a driveway, its looks a little more homey. Mark and I have been settling into our home. 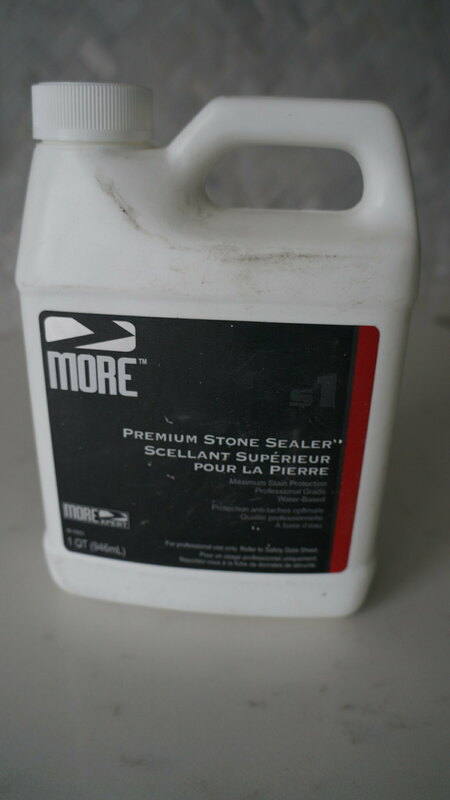 What has been very time consuming is sealing our tiles and grout, particularly in our bathrooms. Cinderella style, cleaning and wiping and drying. On the plus side they look amazing. 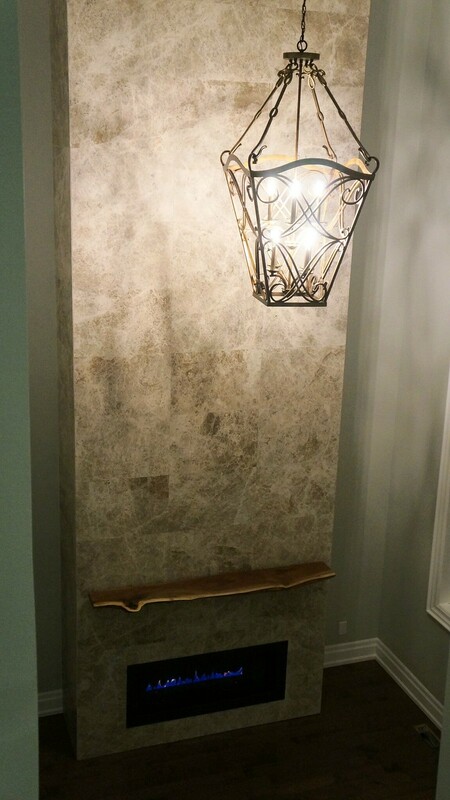 Here is the finished product of our powder room on the main floor. You might notice, this is the only bathroom with a mirror. We picked this particular mirror up at a garage sale last summer! 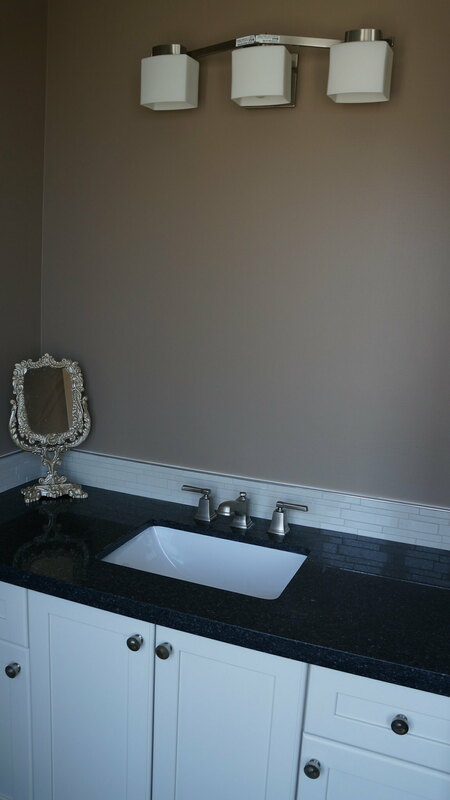 In the guest bathroom, we wanted to try a different look, dark granite countertops, light creamy shaker cabinets. 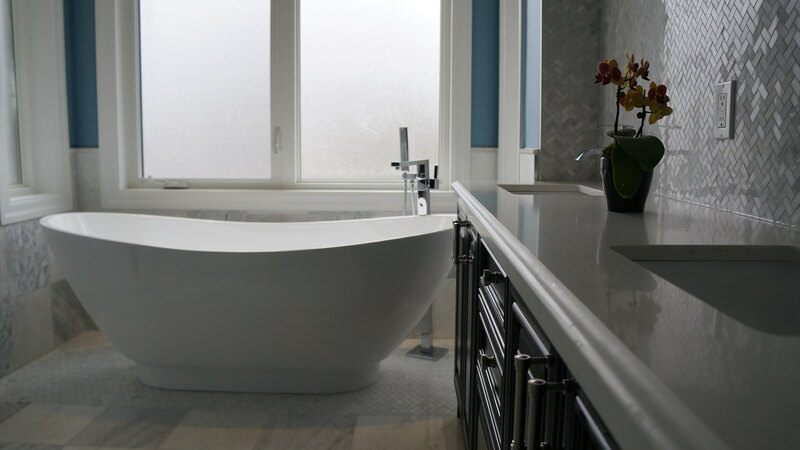 This bathroom has a Jacuzzi tub and heated tile floors. We still don’t have mirrors in here, but on the plus side we got all the other hardware, toilet paper and towel racks! 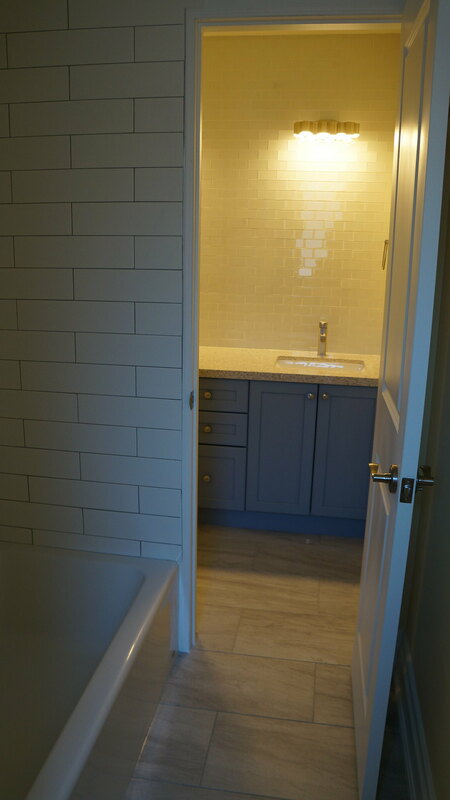 Here is the shared bathroom. I really love the colour of the blue shaker cabinets. 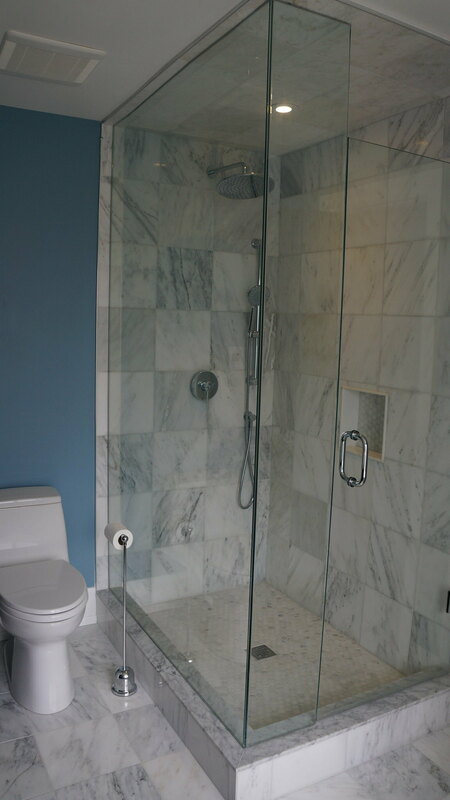 It looks really good with the granite and glass tiles that have a hint of blue. 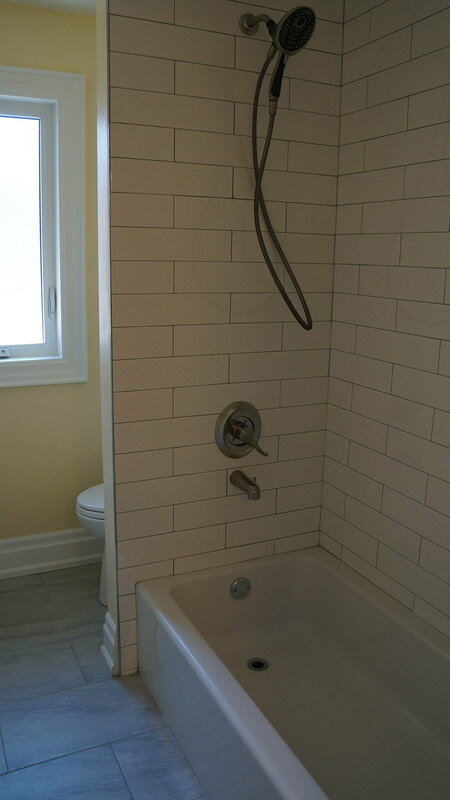 The bathtub and toilet are in a separate section, the subway tiles turned out great. 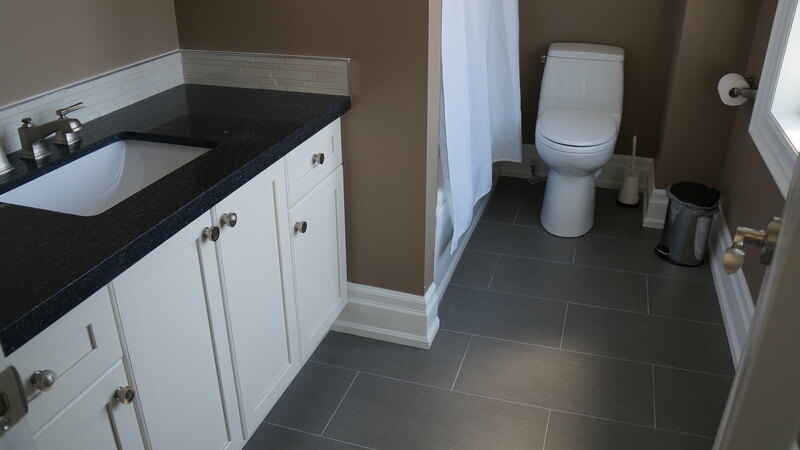 We modeled this after our condo bathroom we renovated a couple years ago, except this has a more ‘fun’ look to it. 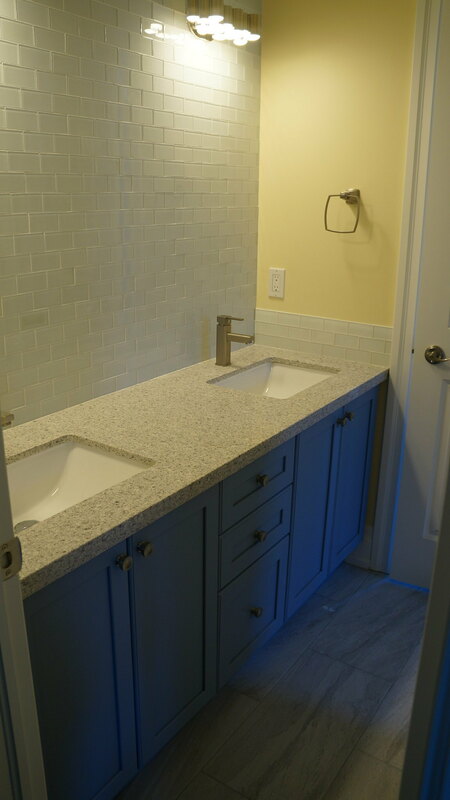 And finally, here is the master bathroom. I think this is my favorite room. 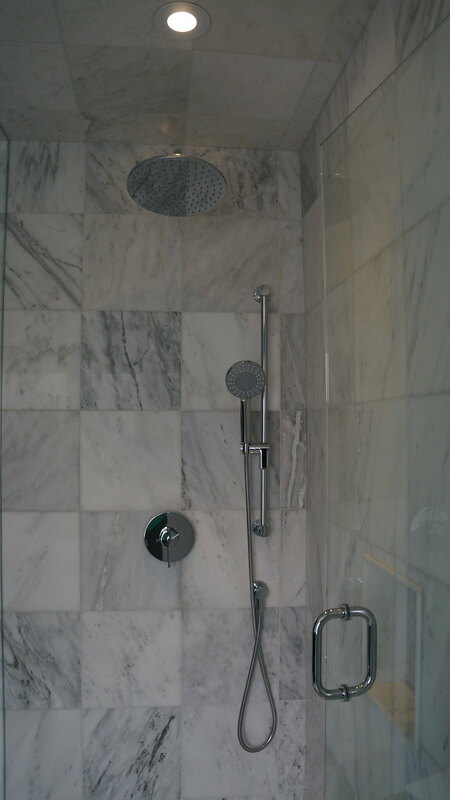 We tiled almost everything, using oriental marble. 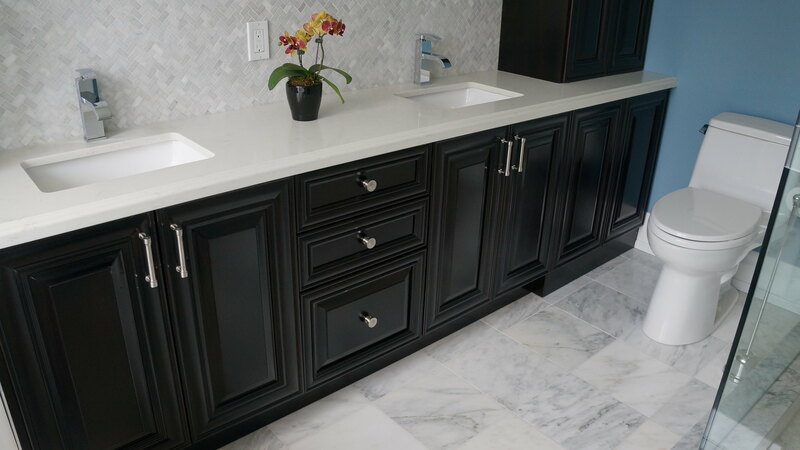 We used beautiful dark cabinets which added some depth to the room. 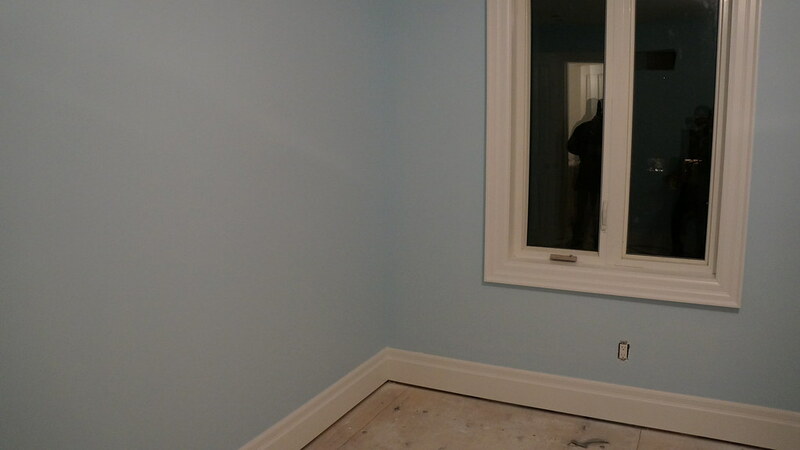 We also went with a dark blue which compliments the colours in our master bedroom. 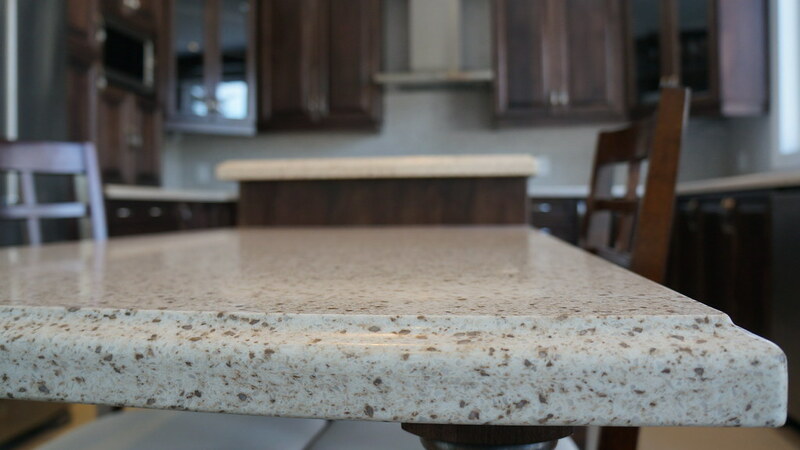 The granite counter-tops are also very light to match the marble tiles. Our cabinets are not as deep as standard cabinets. Typically, there is a dead space behind draws, we eliminated that to gain more room. 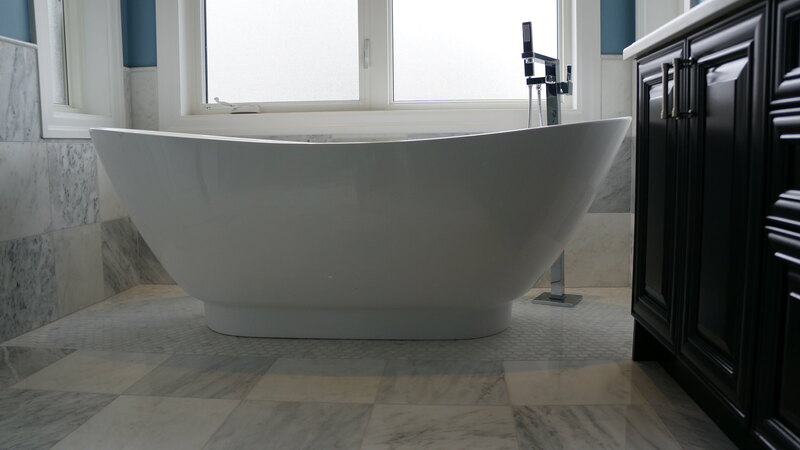 And here is our freestanding tub. I think it turned out exactly like the photos I saw a year ago. 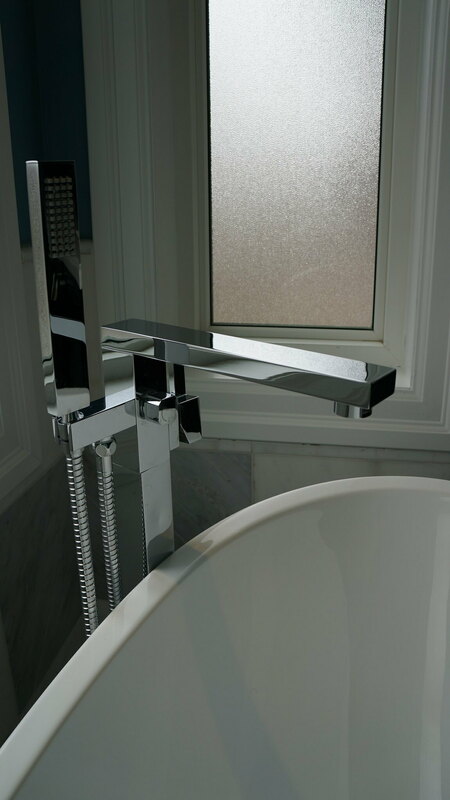 The tub filler is sleek and modern. 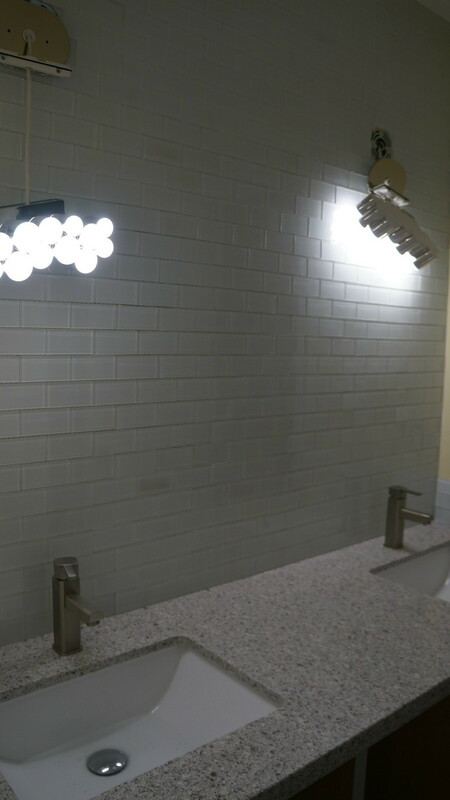 The standing shower fixtures look great with the in shower pot-light. There is a rain shower head and a hand-held which makes for easy cleaning. 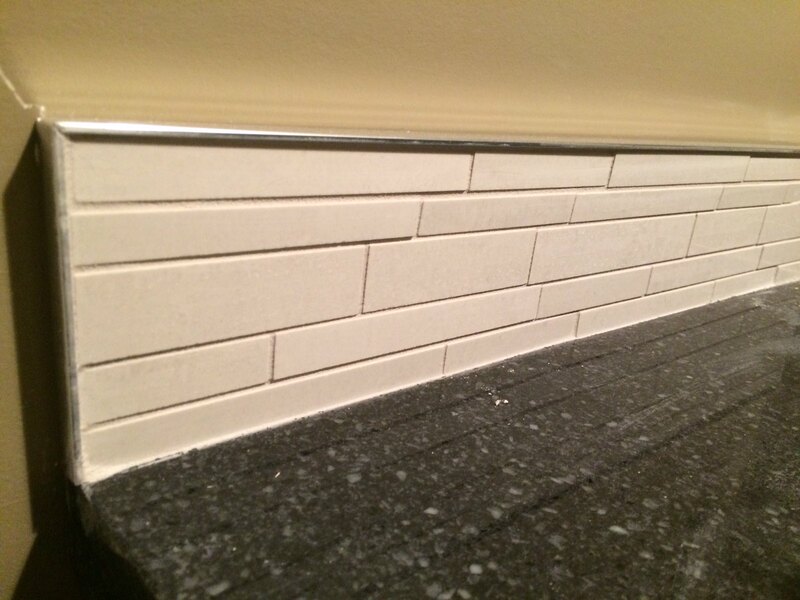 We used the same tile everywhere; to break it up, we used different sized tiles to add more texture. 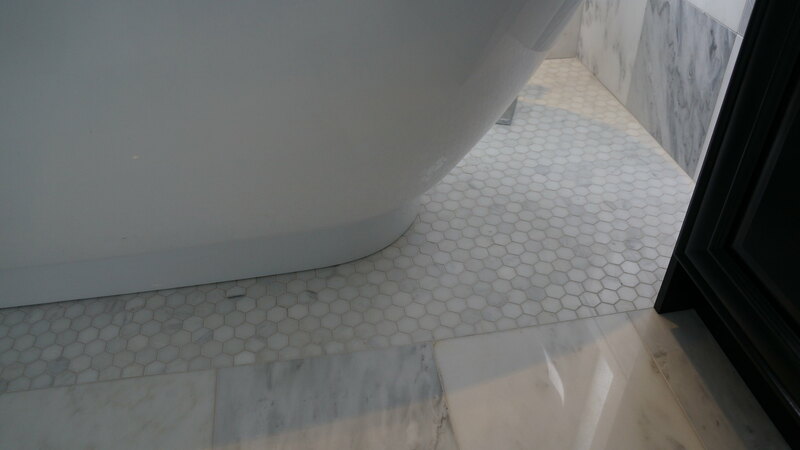 Hexagonal mosaic tiles on the floor of the shower, below the tub, and in the built-in shower caddy. 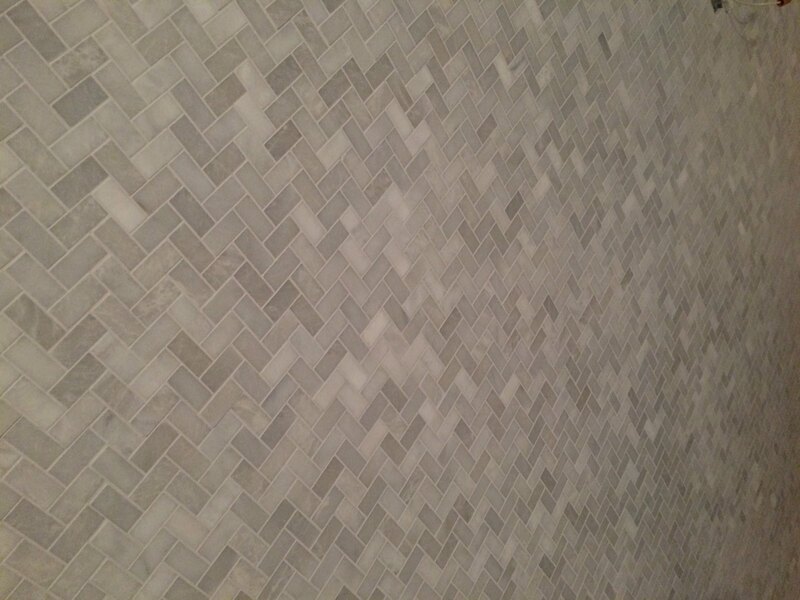 We used herringbone mosaic on the back-splash. Although it is fully functional, we are far from done. We still have to find mirrors for the finishing touches. Time for some shopping! Happy spring! We did not spend much of this winter in our new house, but we have made use of our beautiful fireplace to stay warm on some of the colder nights. Like many homes, we had a small sitting room at the front of the house. We weren’t really sure what to do with it, the main feature was having our large two-storey window. 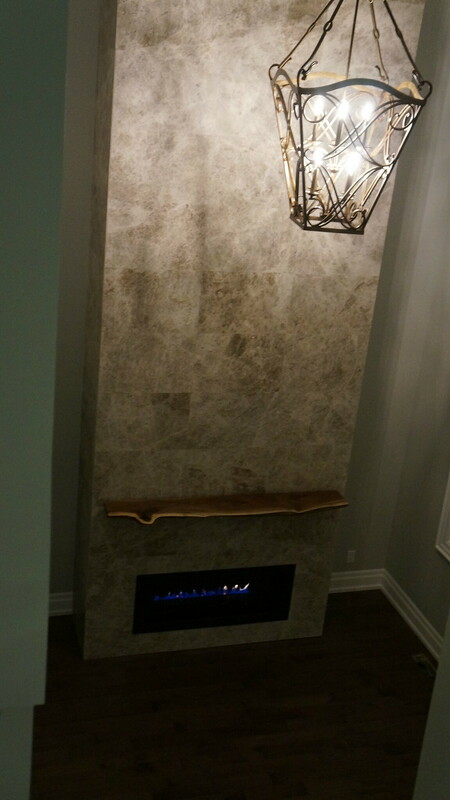 Instead of just having a sitting area, we decided to place a fireplace to have a feature in the area. 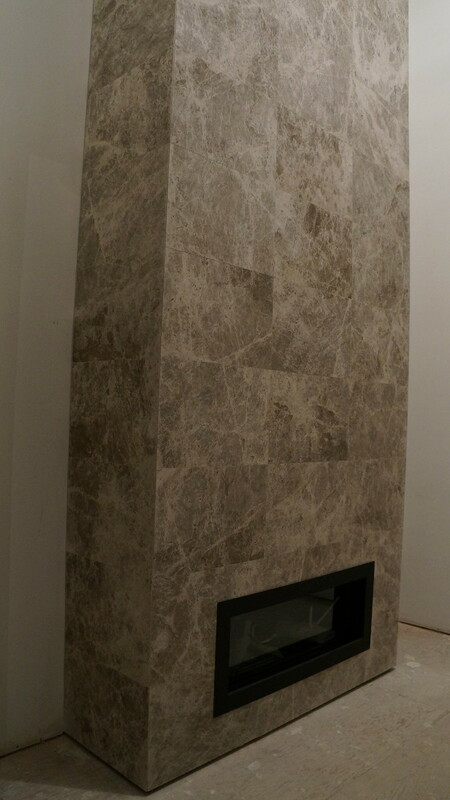 Then we thought, since it was open to above,we would make the fireplace about 18 feet tall. The guys laying our tiles loved that idea. Hahaha! 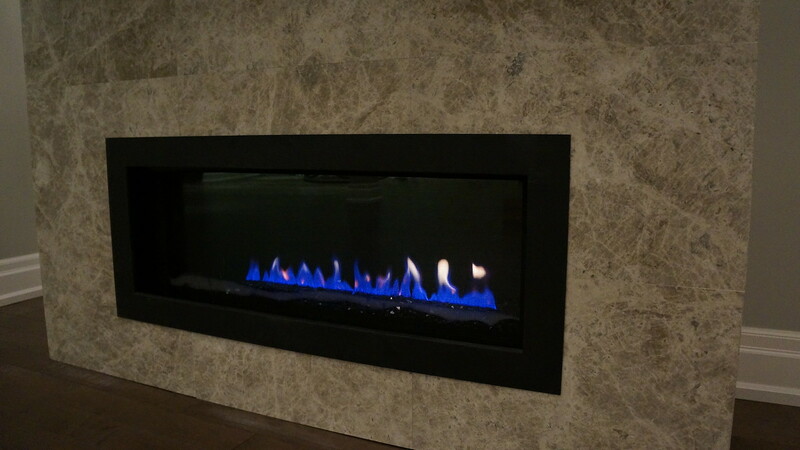 We decided to do a fairly modern fireplace, it’s a small space and wanted to keep it as sleek as possible. At the same time, we didn’t want to commit to a style that would look dated too soon. We went with marble tiles. This was the very first tile Mark and I saw and fell in love with it. 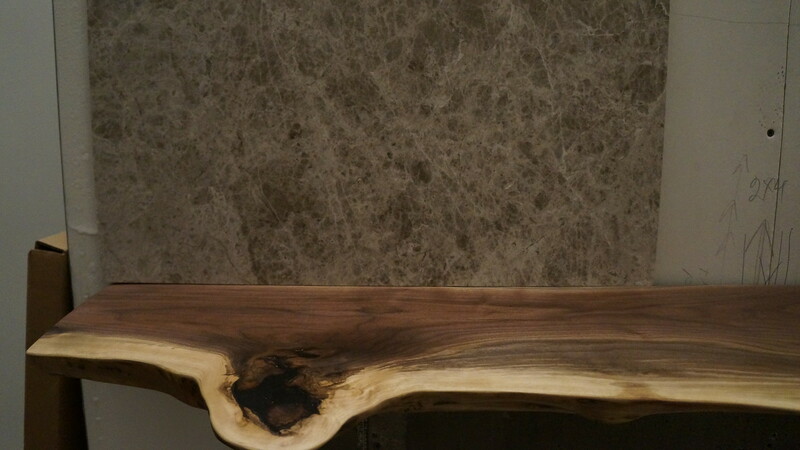 It is called ‘silver shadow’ honed marble. 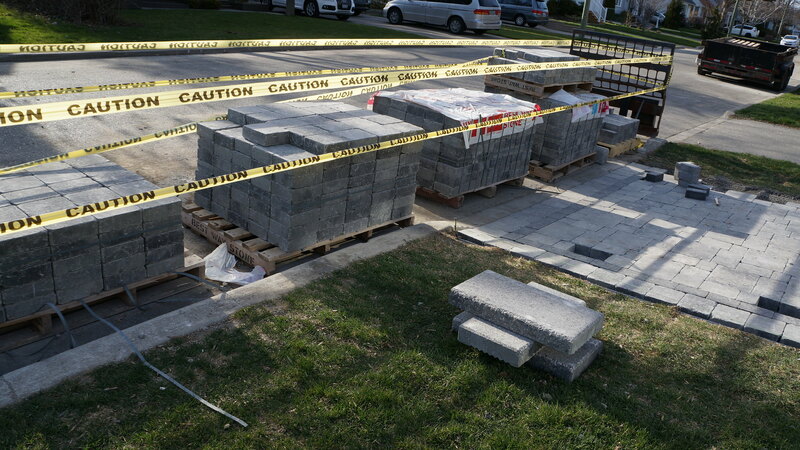 Each tiles weighs about 15 lbs, we estimated the entire fireplace to weigh roughly 1ooo lbs. 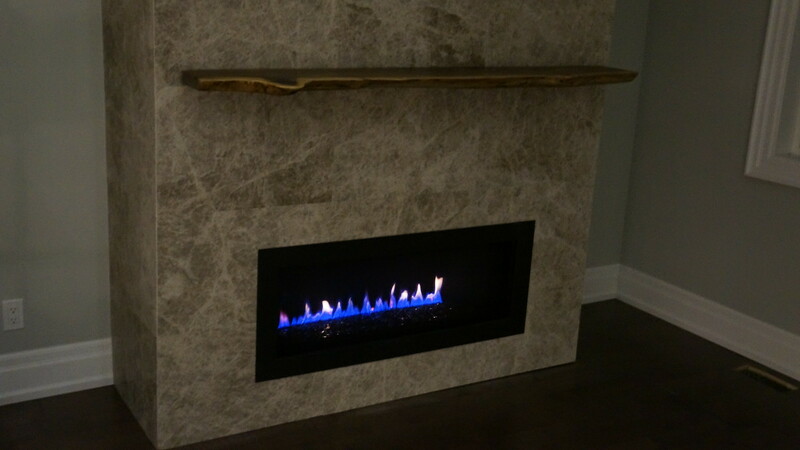 The fireplace is a gas fireplace, more linear in shape, but fairly simple otherwise. The first time we turned it on, there was a lot of smoke, thankfully, none of the 6 smoke detectors went off…..yes, six. New building codes require a smoke / carbon monoxide detector to be in every single room (not bathrooms). When we called for it to get checked out, we were told this is ‘normal’ the first few times and should stop thereafter. They were right, and we have been able to enjoy a smoke free fire…[hmm?]. My grandparents had this beautiful, round, living edge coffee table that I loved while growing up. 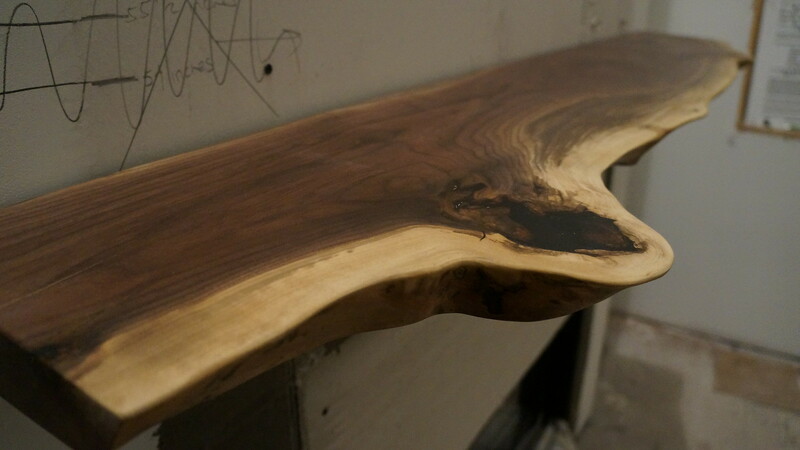 Mark liked the idea, so we decided to get a live edge mantle made for our fireplace. 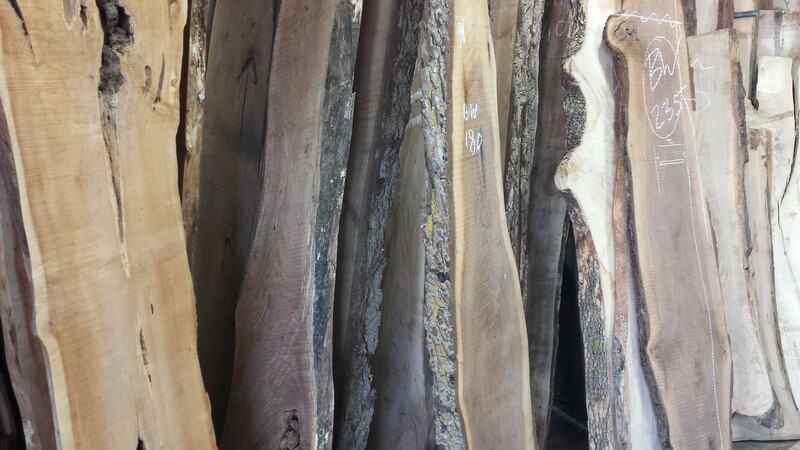 We found a local shop called Roca Wood Works. They have slabs of fallen trees. We went in and picked one we liked that fit our specifications. They finish everything right in the shop. 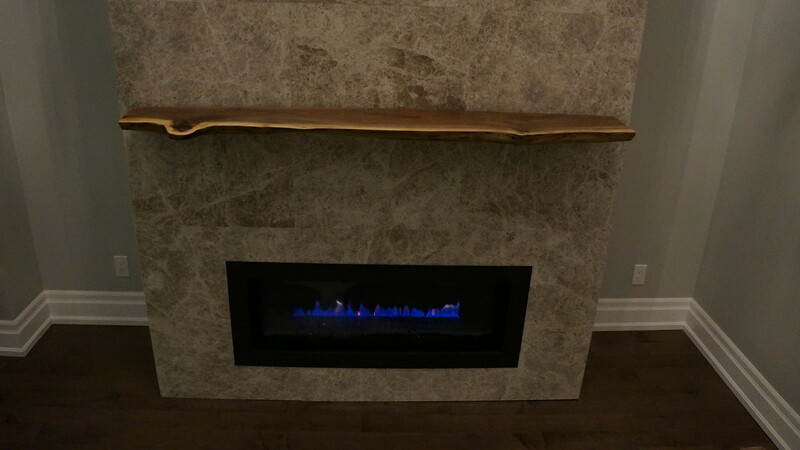 We had a go back a few times to make small adjustments and got advice on how to install the piece. They were very helpful and did an amazing job! We picked a black walnut that had a few knots in it. The colour compliments the brown veining in the tiles. 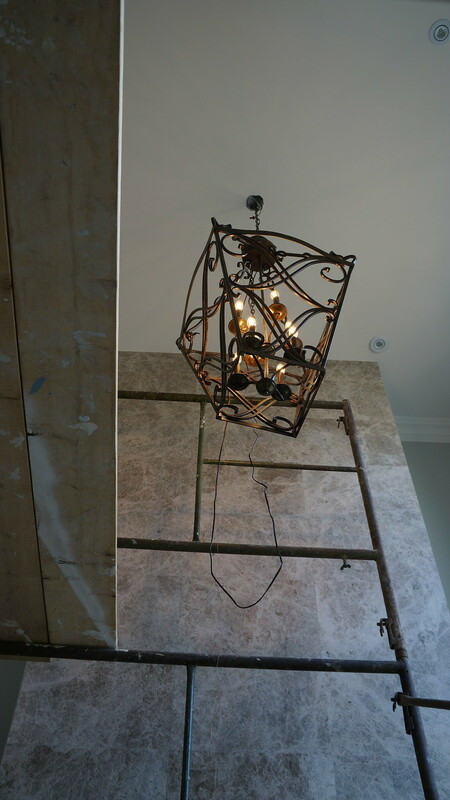 To balance out the room we also found a large 4ft tall chandelier. It’s transitional in style, and longer than it is wider. Since the room is quite tall, we needed to occupy some of the vertical space. 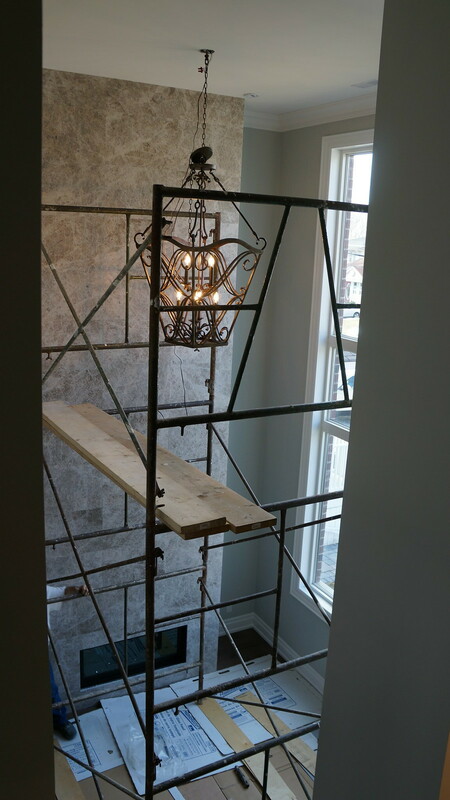 We had to set up some scaffolding to do both the fireplace and installing the chandelier. Overall, we are very happy with how it all looks, all that is left is furnishing the room! 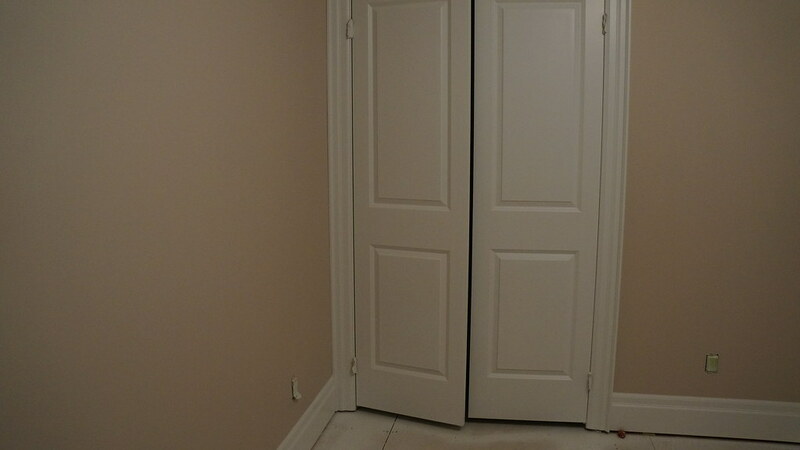 The doors were one of the last things to be installed, similar to the hardwood, we didn’t want the finish to get damaged while other work was getting done. 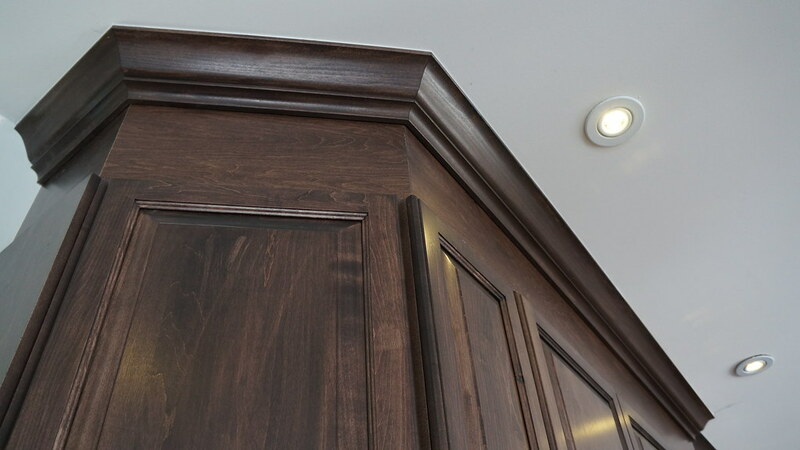 We choose a dark stain on maple for the doors, and capped the top with matching crown molding. 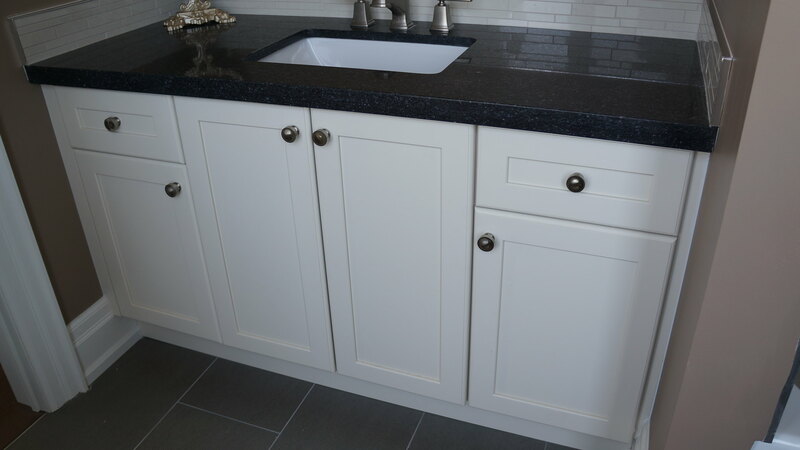 Instead of a simple shaker door, we went with a raised panel door. 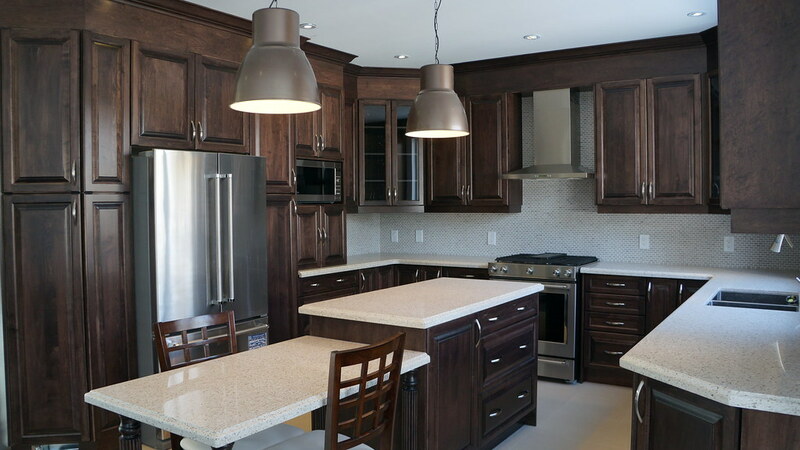 It adds some depth and richness to the kitchen, making it look a bit more traditional. 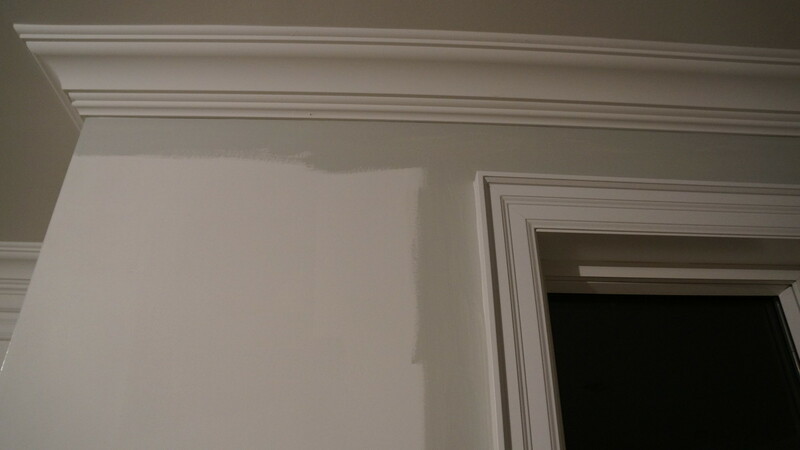 We kept it looking fairly modern by not choosing an arched or cathedral style, just a simple square trim. 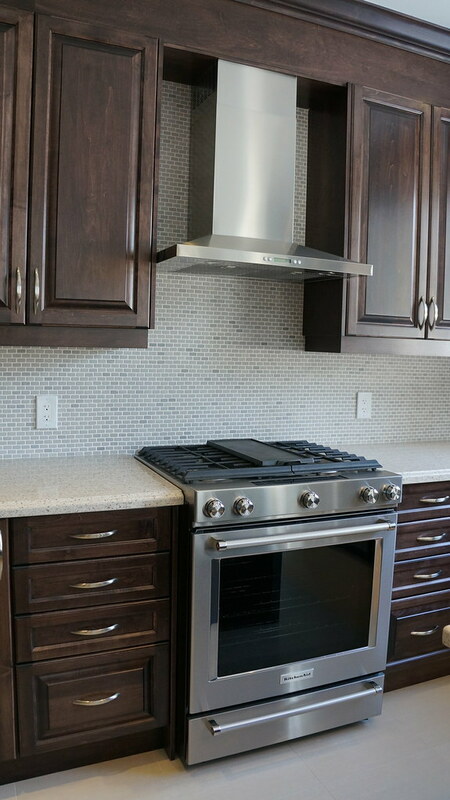 To offset the dark wood, we used lighter coloured floors, backsplash, and counter top. 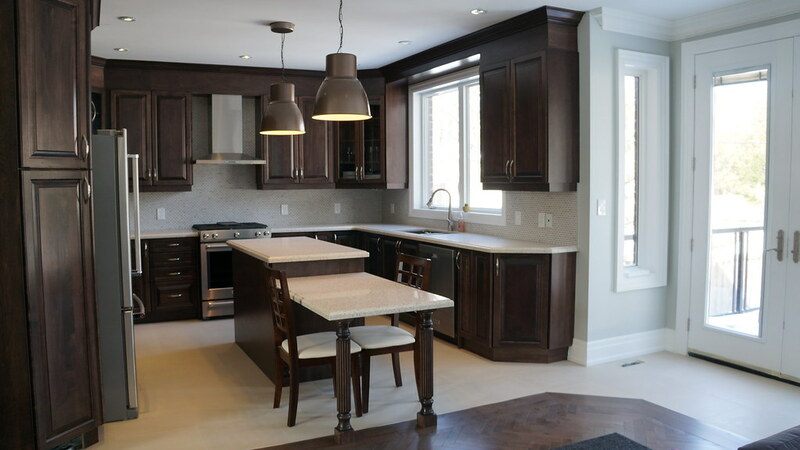 The counter top has both the dark brown flecks that matches the wood cabinets, and grey flecks from the grey backsplash that really ties the kitchen all together. We have a U shaped kitchen, and wanted an island in the middle. To keep an open feel, we angled the cabinets at the edges of the kitchen which flows nicely into the open layout in the rest of the house. 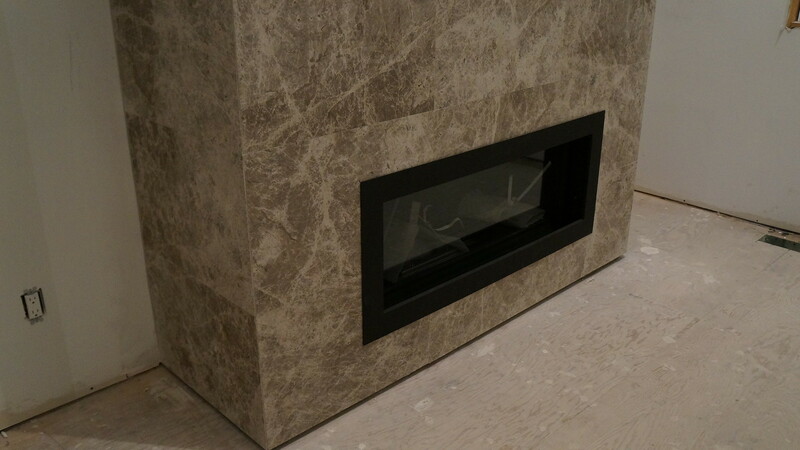 The floors are a highly durable square porcelain tile that is a light cream colour. Don’t mind the off coloured light switch plate, the matching brown ones are on back order and we needed to pass our inspection. 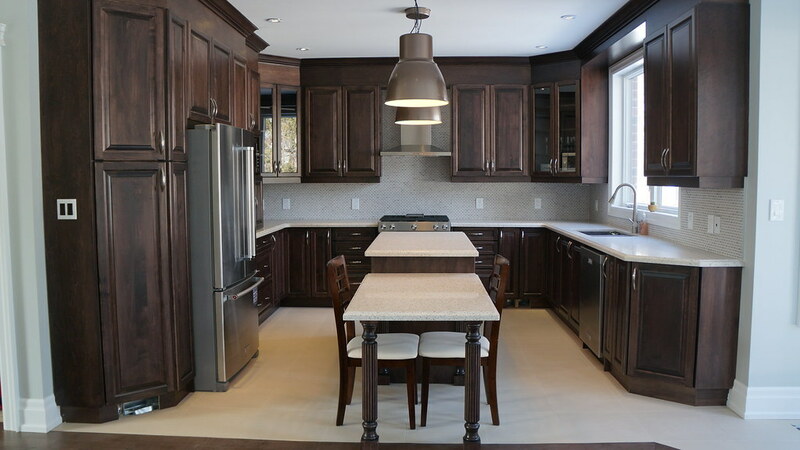 We were a bit nervous about having enough space around the island but our kitchen designer, Carlton, at Beach Custom Cabinets did a great job scaling the size of the island to allow enough room to walk around, have a functional island with storage, and an eat in table that Mark wanted. 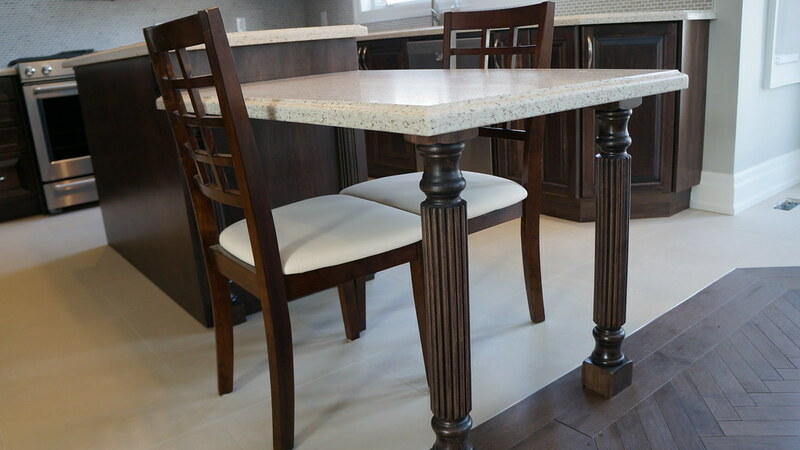 I wanted the eating table to be at table height, I’m not a fan of having my feet swinging while eating or hopping up on a high stool. We lowered that part of the island. 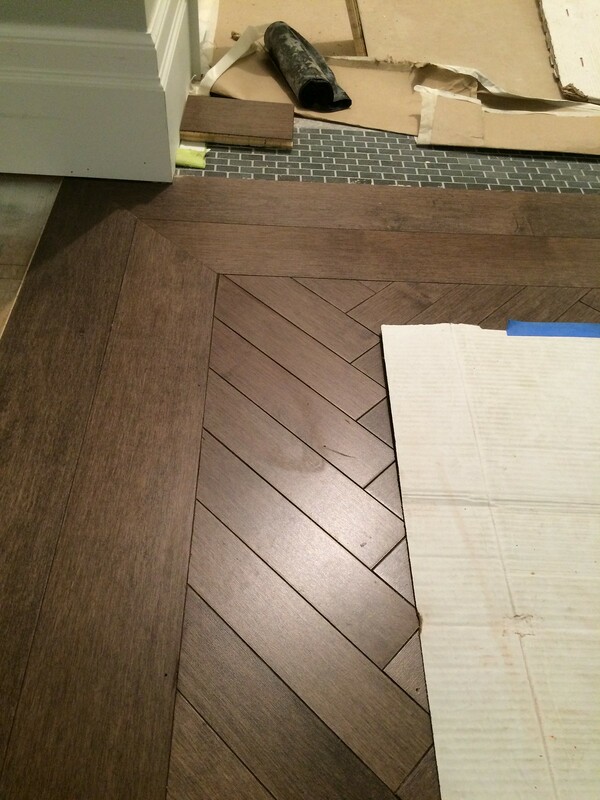 The legs are elaborate and ties in nicely with the herringbone style hardwood. On one side of the kitchen around the Fridge, we did a pantry wall. 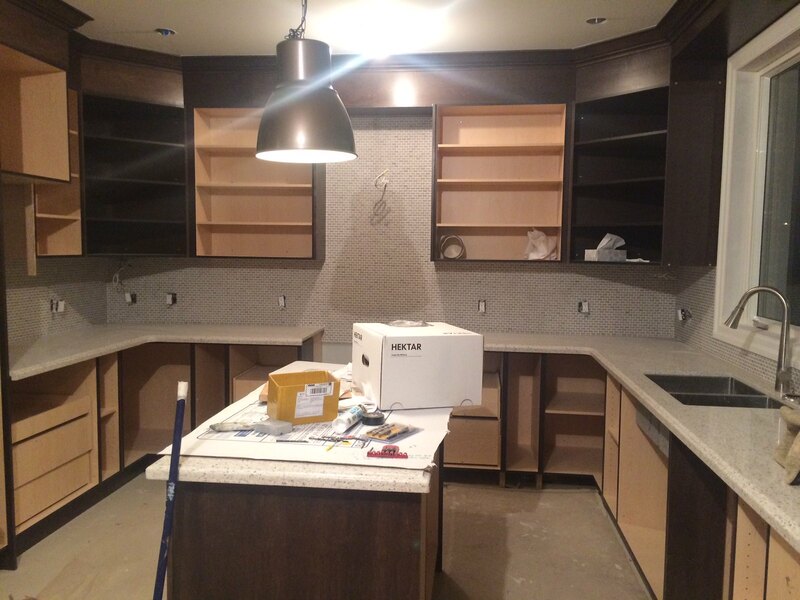 No counter tops, just all cupboards. Under the microwave we did a closed cabinet appliance garage. 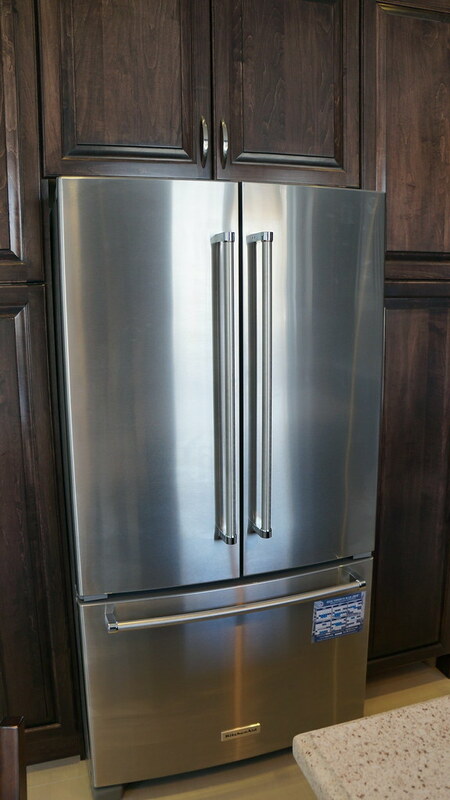 Our appliances are Kitchen Aid, it’s an adjustment to have such a wide fridge. 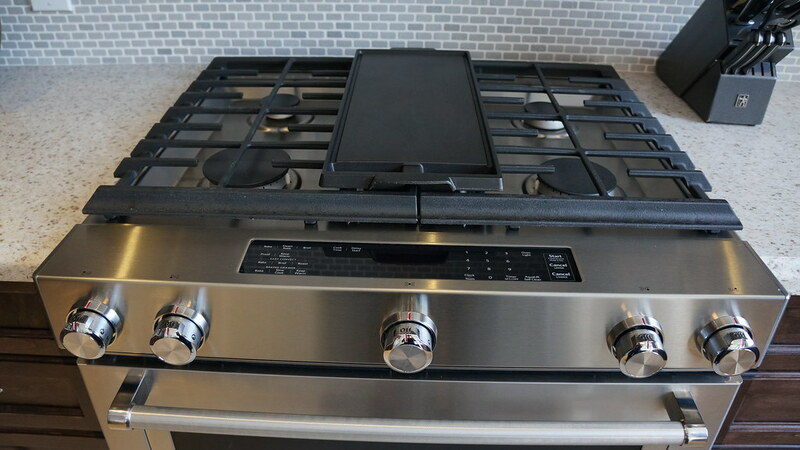 The stove is duel fuel, gas stove-top and an electric oven, it has a warming drawer at the bottom! I love it. I also really love how the hood fan caps it off at the top. I also love the super cheap metallic brown lights from Ikea. I think it turned out quite nicely. I was surprised to find out from my father-in-law that hardwood is [one of] the last thing[s] to be installed. This is definitely the case if you install prefinished hardwood. For unfinished you can install the hardwood sooner and then do the sanding and staining last. Hardwood is done as late as possible to avoid damage to the finish; you don’t want to scuff up your newly installed hardwood. 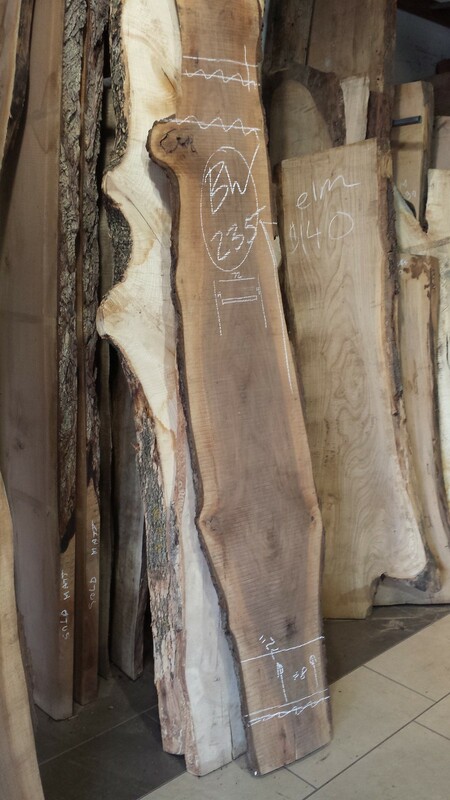 Despite this, you still need to pick your hardwood, or have an idea of what you want, fairly early. Mainly to know how thick your floor is going to be. The thickness ideally should match up with tiles when it transitions from tiles to hardwood, and fit under the baseboards. 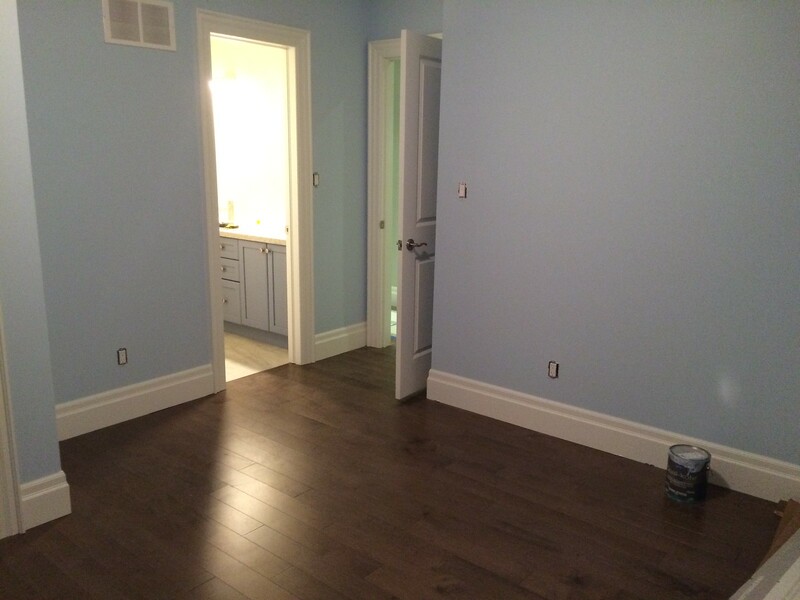 That right, we did the baseboards before the hardwood, it was installed slightly off the sub-floor allowing the hardwood to be tucked under, shoe mold is used to cover any seams or gaps. 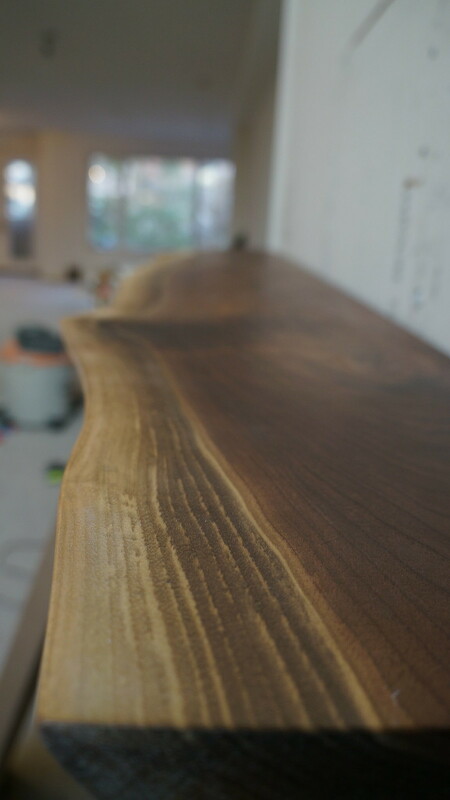 Mark and I debated between prefinished and unfinished wood, but in the end we went with prefinished hardwood. 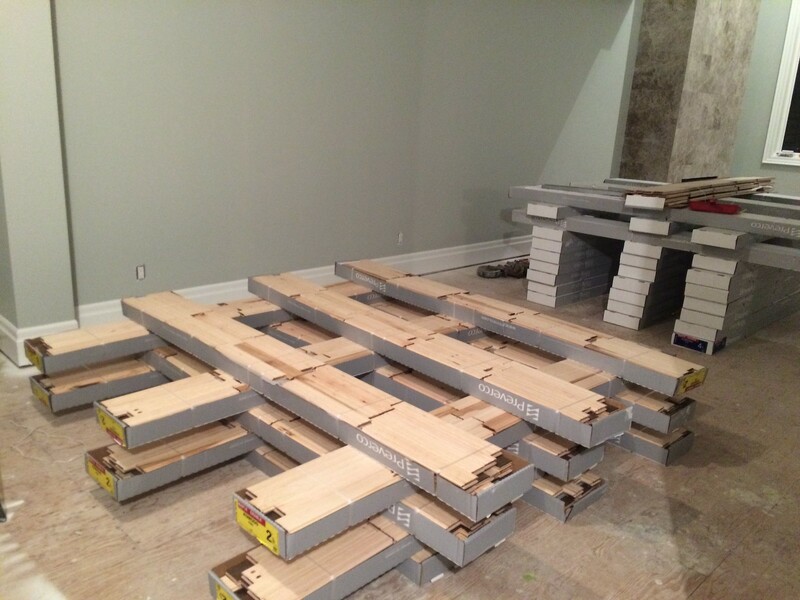 With unfinished hardwood you can sand and stain many times to refresh / update your floors. 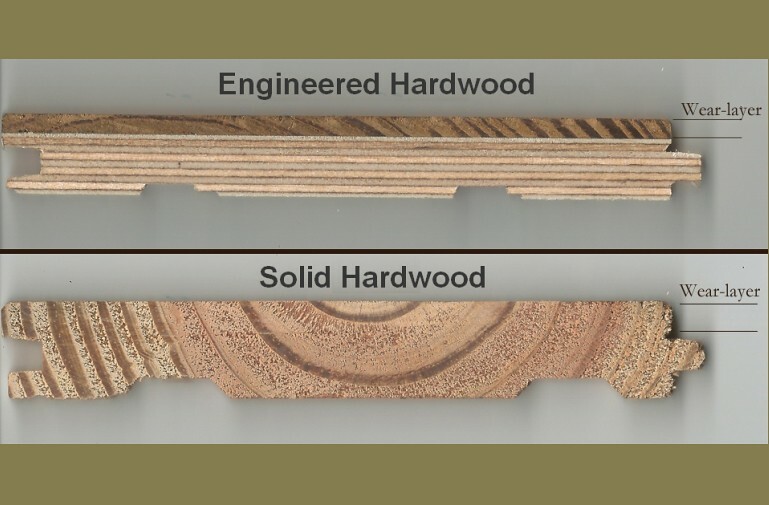 You can sand and re-stain prefinished hardwood but not as often, especially if it is engineered hardwood as it has a thin layer of the natural hardwood on top of other wood. Prefinished hardwood also has several factory installed stain and varnish, which means it will ‘hold up’ better with wear and tear over time. 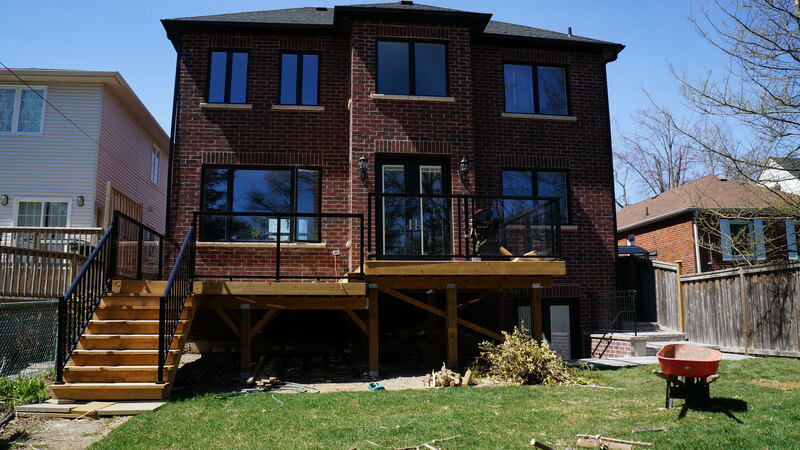 Regardless of the type, the hardwood has to be acclimatize to where it is getting installed, humidity and even height (think 15 stories up in a condominium) effects the wood. Mark and I (really mostly Mark) moved the hardwood to each room and spaced them out to help this process along. 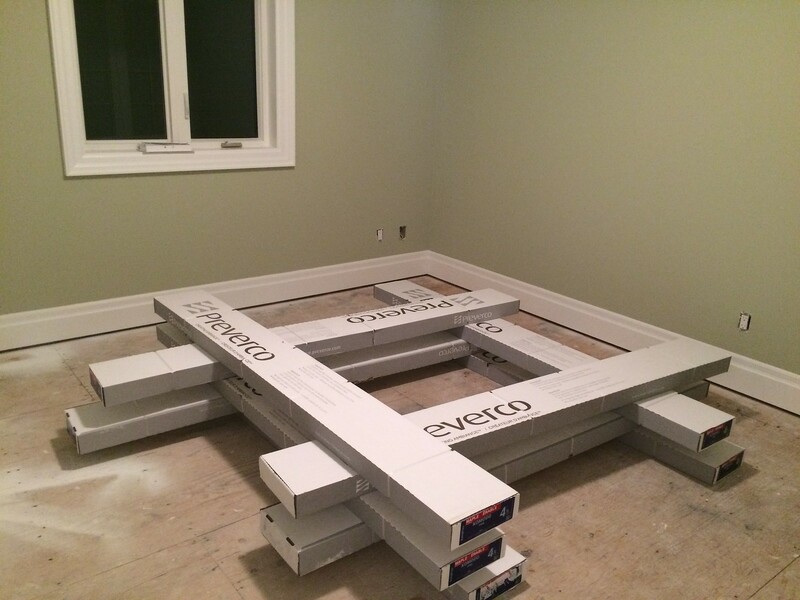 It typically sits for a few days before it is ready to install. At Woodchuck we found a beautiful maple hardwood in a medium brown finish called komodo. We also had an idea to do something a little different with our floors. Since we have an open layout, we wanted to add some distinction on the ground floor. 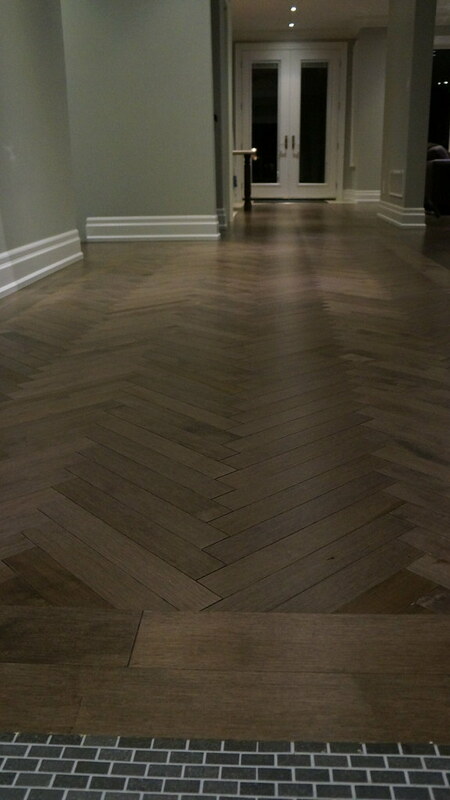 So, we decided to do a herringbone pattern in the hallway that would run straight from the front door to the backdoor. 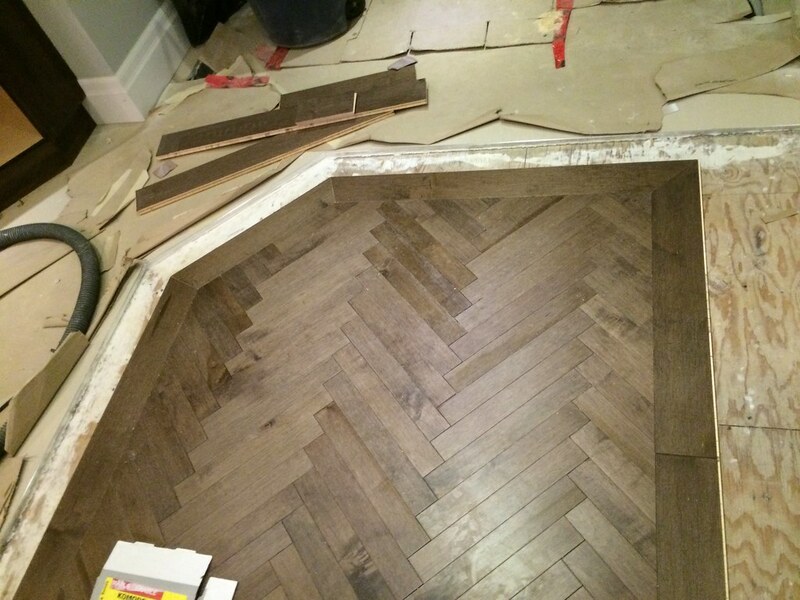 This also meant we needed to find prefinished hardwood that can accommodate a herringbone pattern. 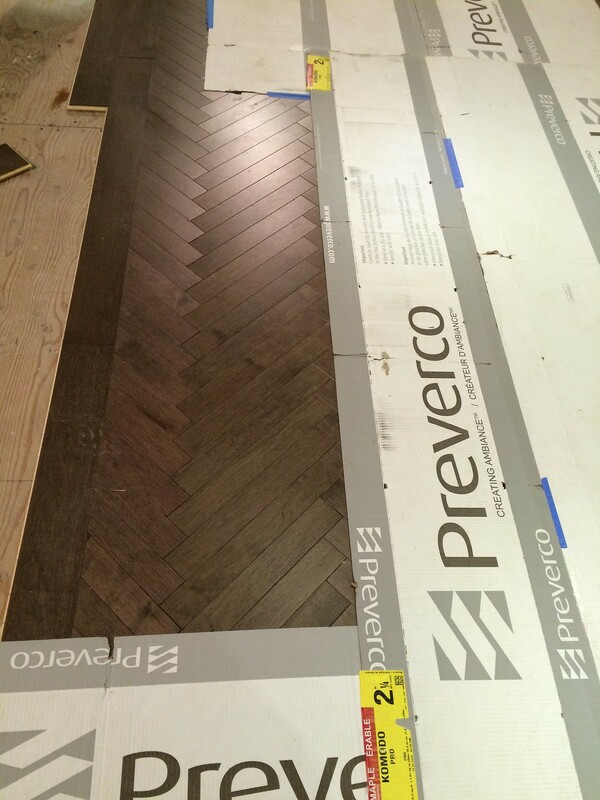 Perverco is a Canadian hardwood that has both standard and herringbone cuts for laying. 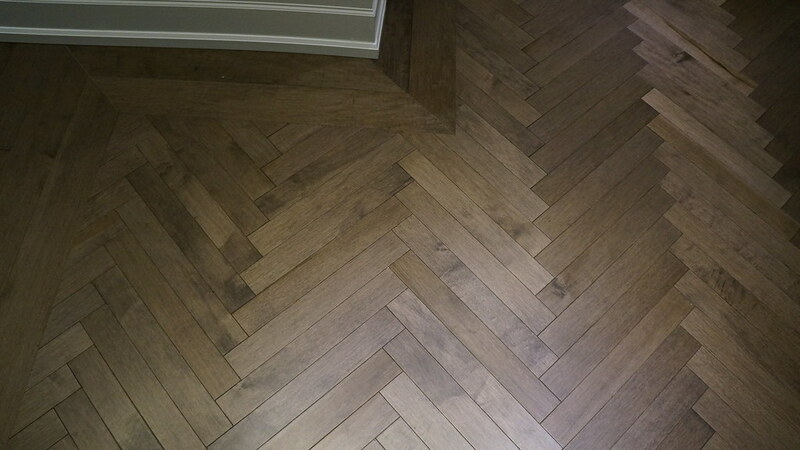 Herringbone is evenly sized with all the same length. A standard pattern come some varying lengths. We did a 4 ¼ inches wide standard lay hardwood everywhere in the house with the exception of the hallway. 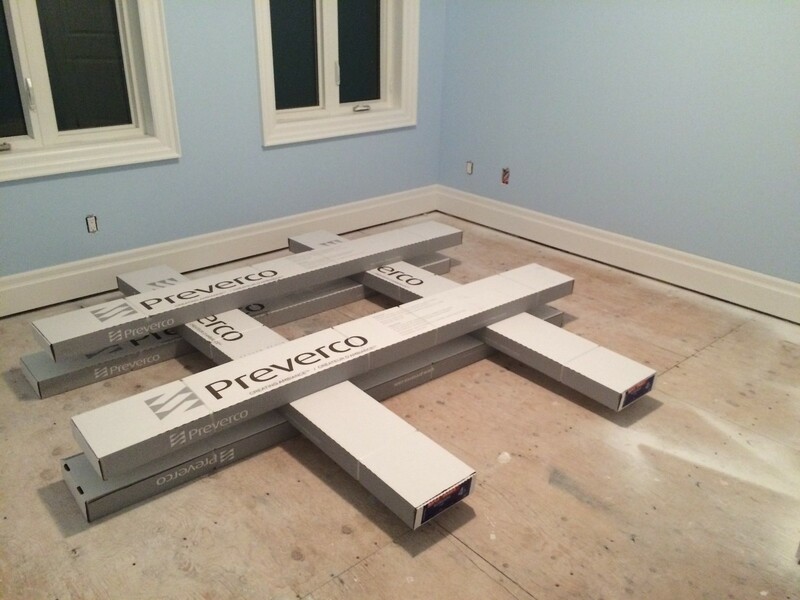 Anything wider than 4 inches is engineered hardwood with this Perverco product; it is less prone to warping. 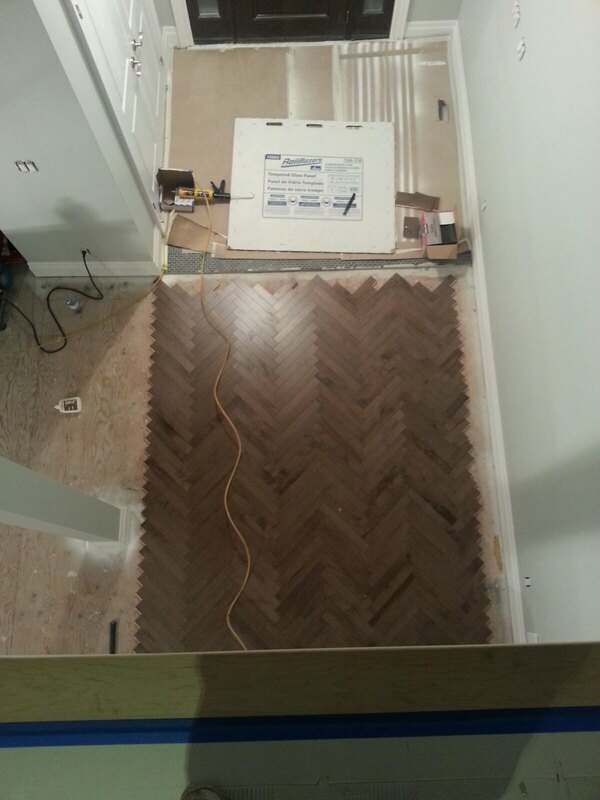 For the hallway, we did a 2 ¼ wide hardwood for the herringbone. 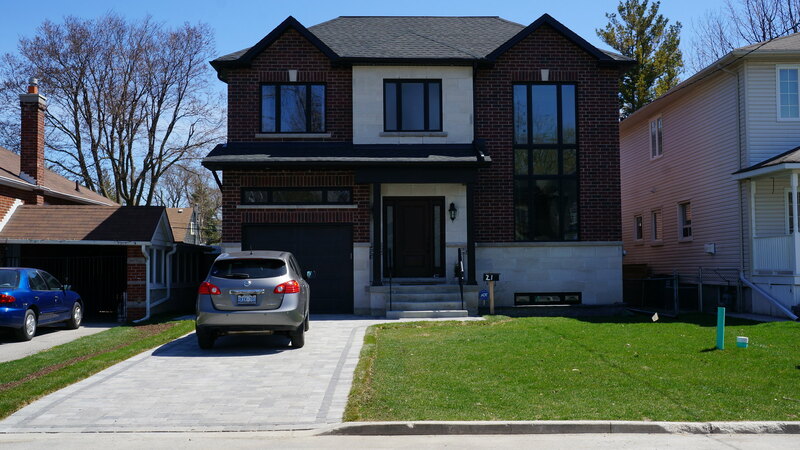 I think it really adds definition to the layout, makes the house seem longer, and draws your eyes right out to the backyard. 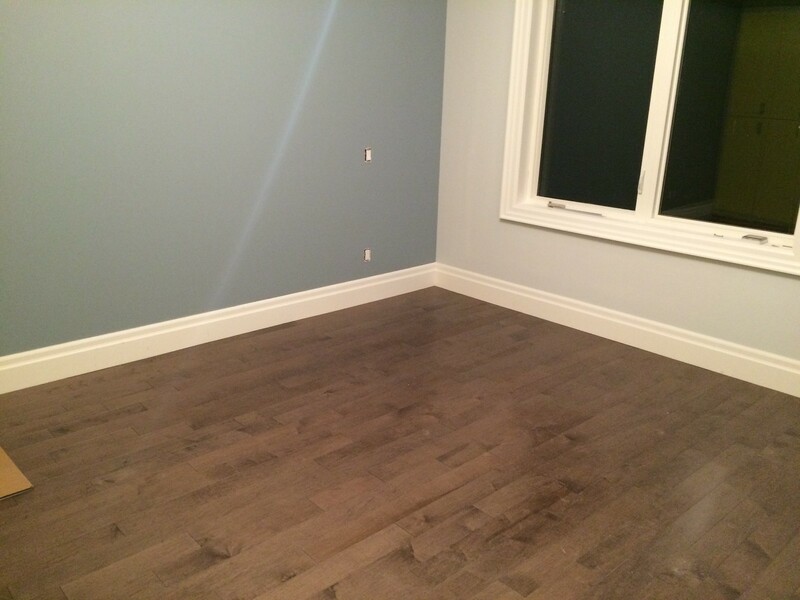 Both the 4 ¼ inch and 2 ¼ inch hardwood are the same thickness, this was the advantage of going with this product as it allowed the different sizes to be installed together. 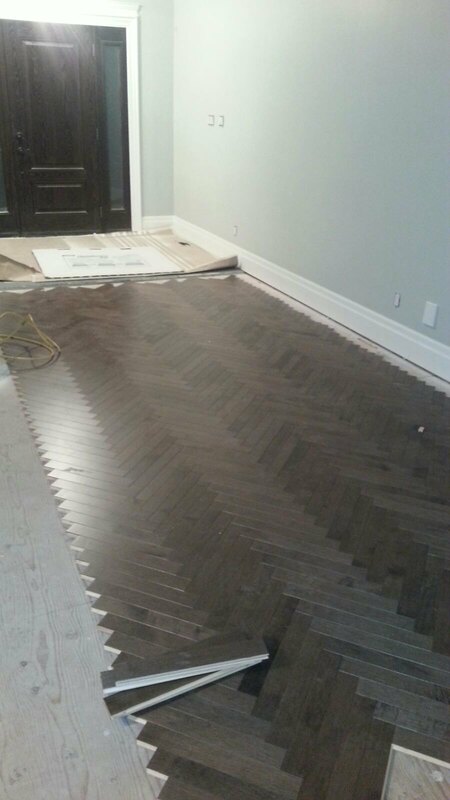 You can see we used the regular 4 ¼ inch hardwood as a frame / boarder for the herringbone. 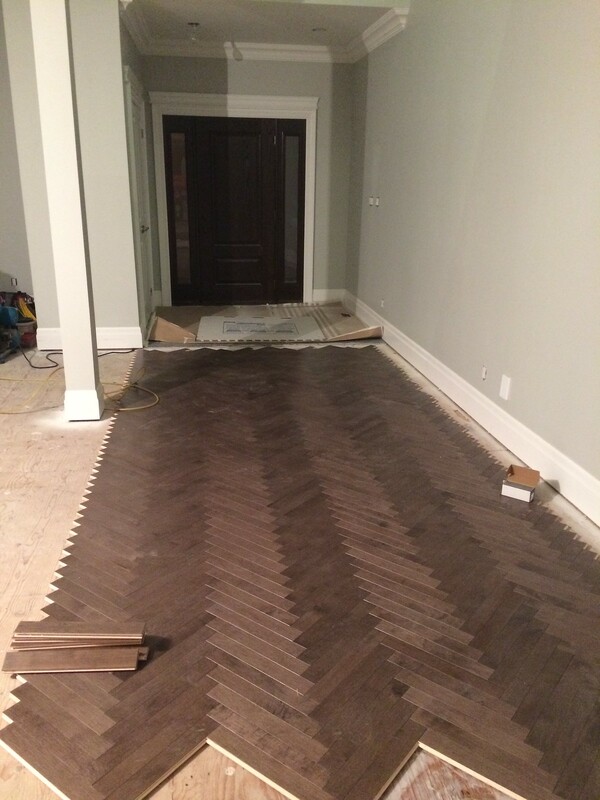 There are not many people with experience with installing herringbone style hardwood, fortunately a friend’s aunt and uncle is familiar with doing this. They really talked us through the process to help us understand how the hardwood gets installed, particularly the herringbone, and how to care for the wood. It looks amazing if I do say so myself. 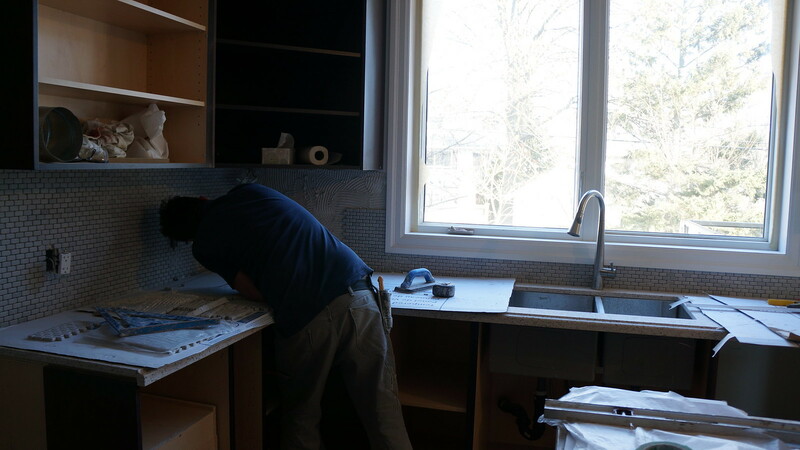 All the backsplashes have been laid a few weeks ago now. 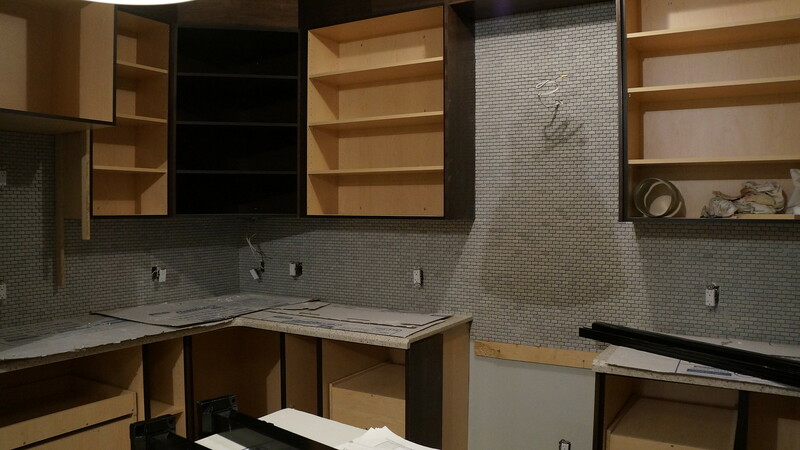 We had to wait for all our countertops to be installed in the bathrooms and kitchen since the tiles are meant to meet the top of the countertop. 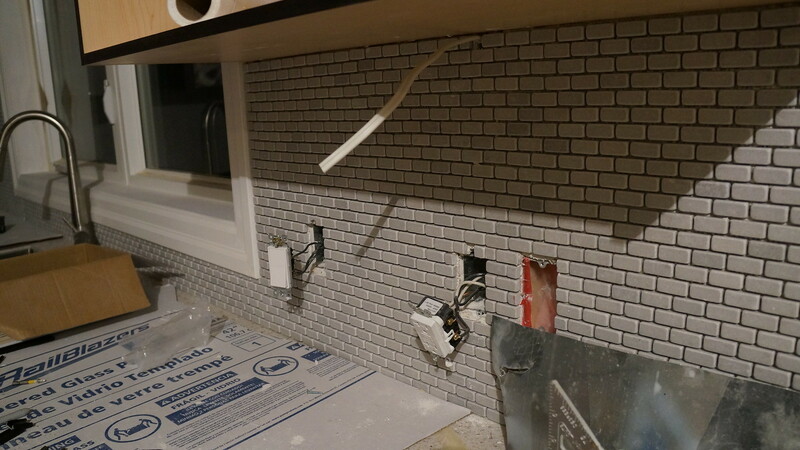 This was the last of our tiles to be put in; and we spent quite a bit of time at Olympia tiles and Home Depot picking out tiles that would be a nice statement, but not be quickly dated. 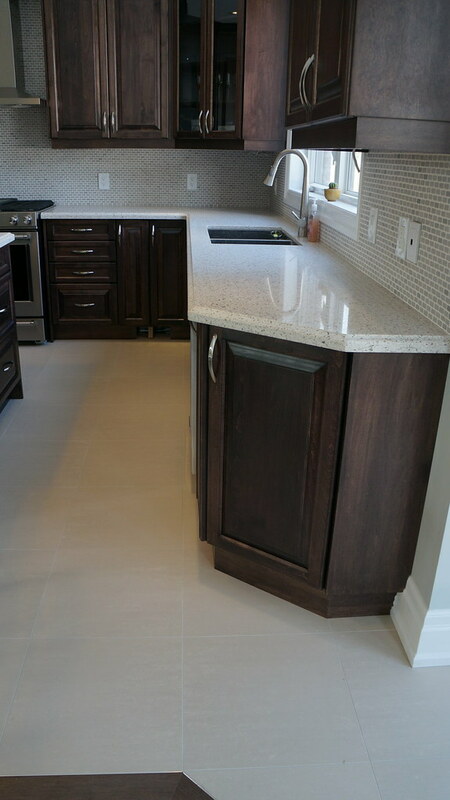 For our kitchen we went with a natural stone, a smooth rounded edge marble tile. 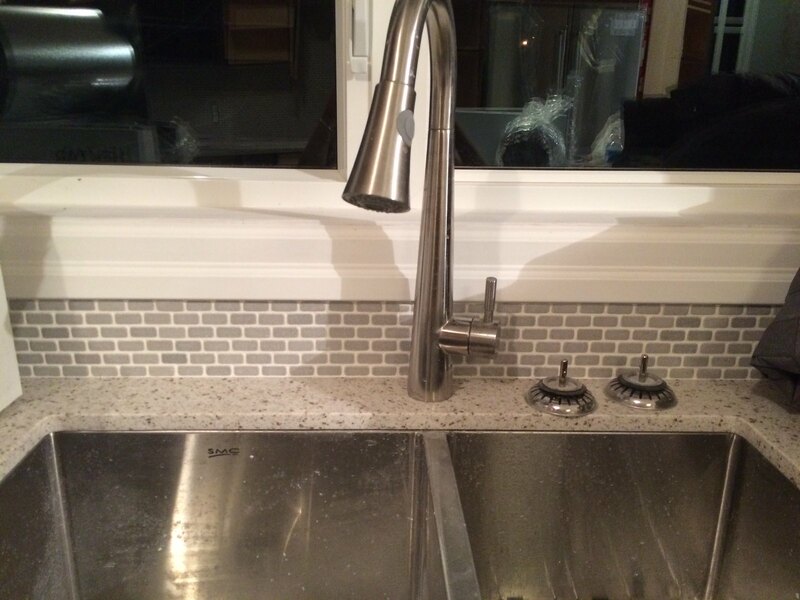 They are a beautiful gray colour that picks up the grey flecks in our quartz countertops and will naturally transition into the Grey Owl paint we selected by Benjamin Moore. 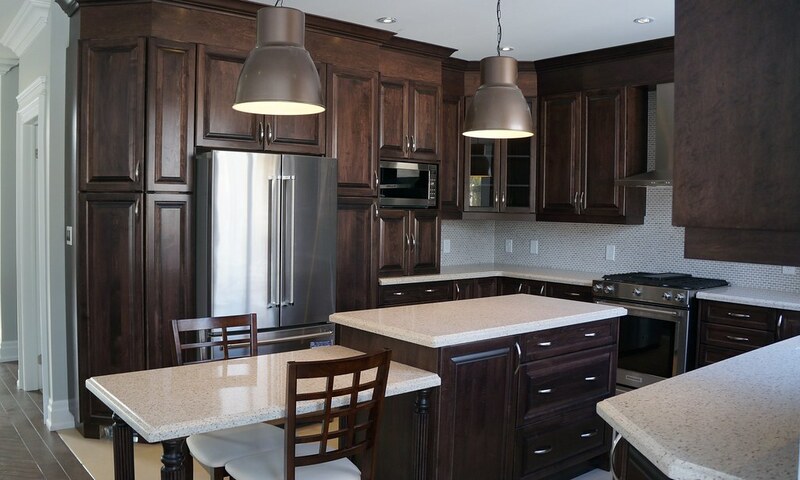 It will tone down the dark wood of the cabinets,… …and compliment all our stainless steel appliances and fixtures. I love how well centered / lined-up everything is; the light fixture casts a shadow perfectly where the hood fan will go in the image above. 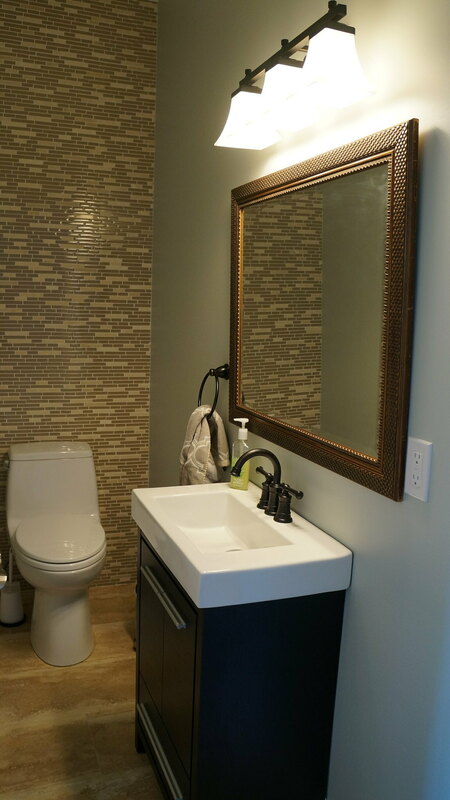 In our guest bathroom, we went fairly simple and reused some of the mosaic tiles that accented the shower stall. 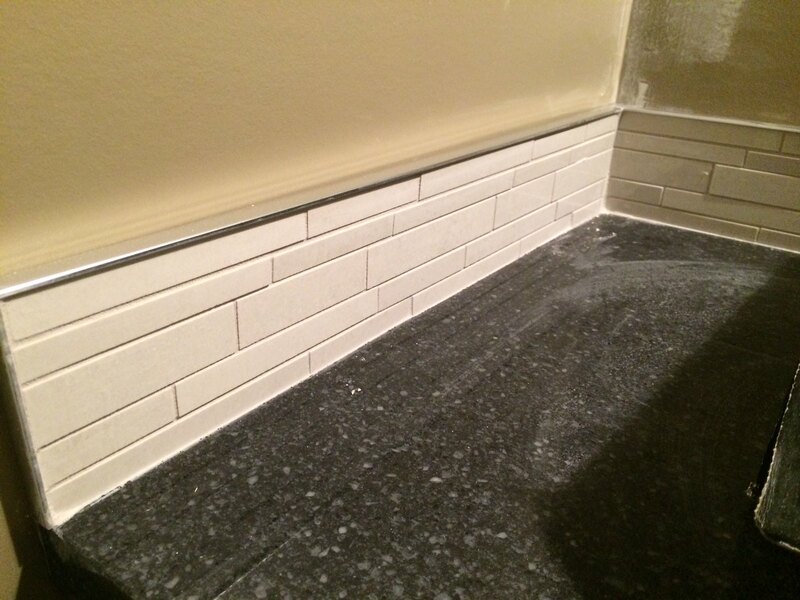 We kept the backsplash low just to stop water from splashing onto the wall too much. We decided to go all out for our shared bathroom. 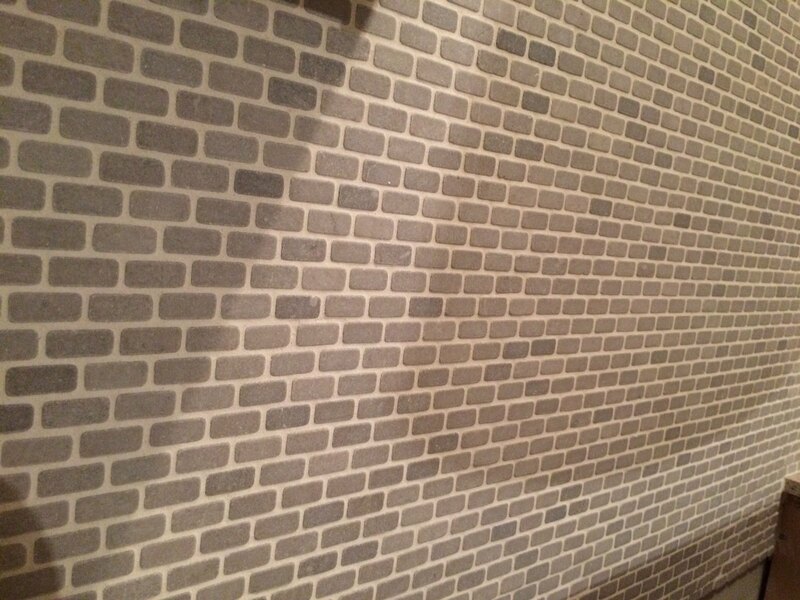 We found a really cheap tile at Home Depot, and bought enough to do the entire wall from countertop to ceiling. 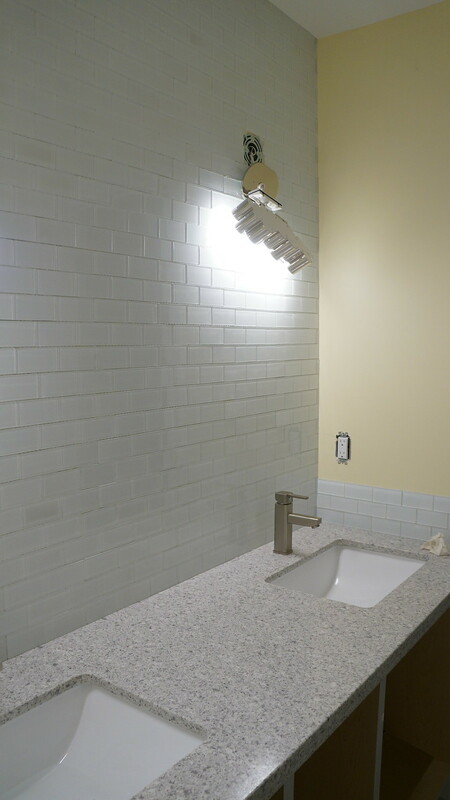 It’s a really simple arctic white glass tile, small subway tile style. When the lights reflected off the glass, it really brightens up a fairly small space. 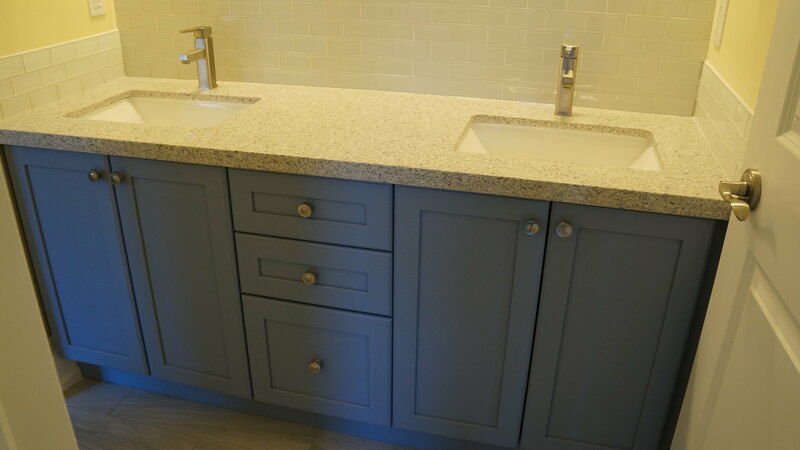 It works really well with some of the blue gray tones in the countertops. 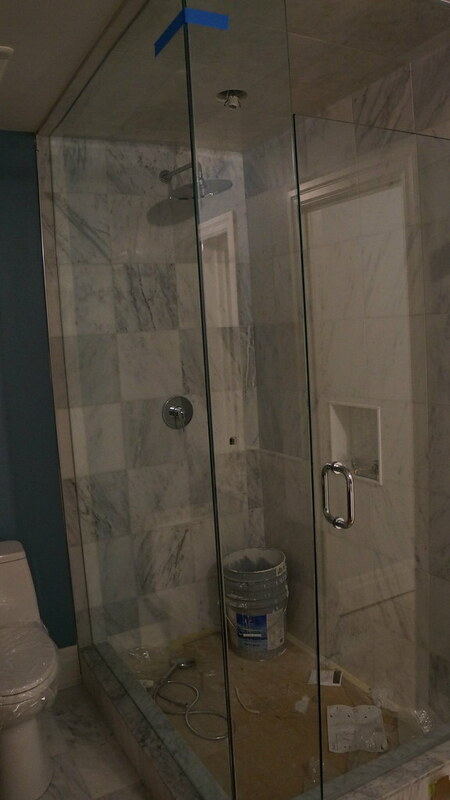 Finally for our master bathroom, we completed the look with more oriental marble. 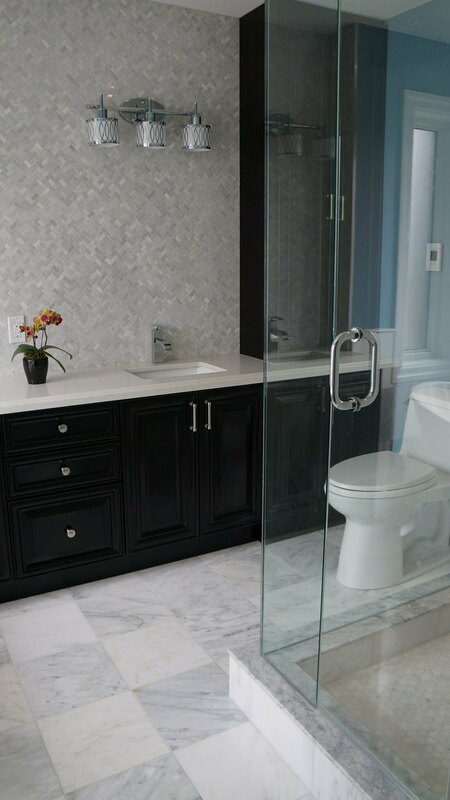 This bathroom is looking amazing. 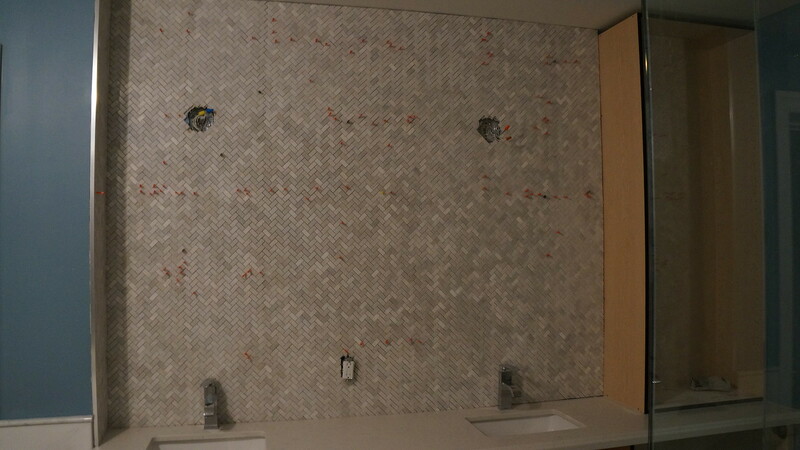 We went with a small herringbone mosaic tile, and like the shared bathroom, covered the entire wall from countertop to ceiling. We are bit sad that a mirror of some sort will inevitably cover up quite a bit of the tiles, but it just looks so good. I’m in love!!! 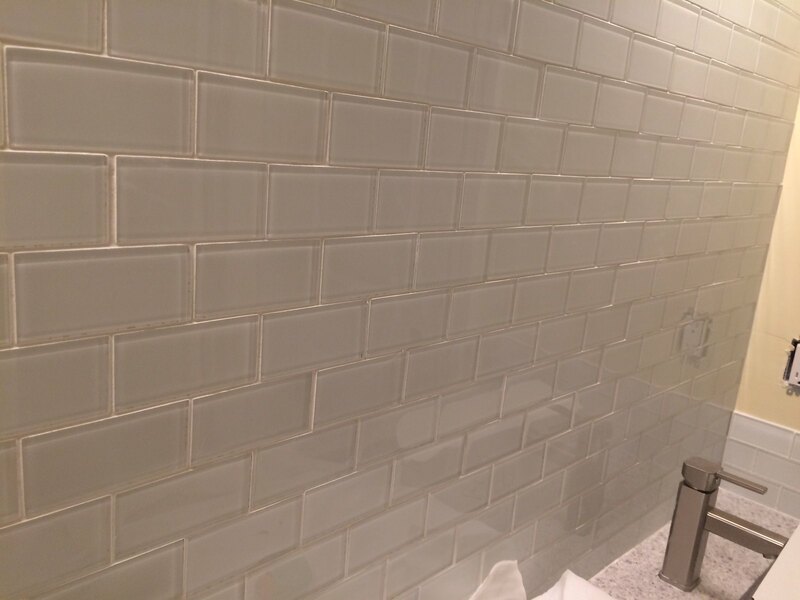 Until I have to spend hours sealing all these tiles and grout. Our paint has been well underway for a few weeks now. It has been a process. A few key spots get painted first. 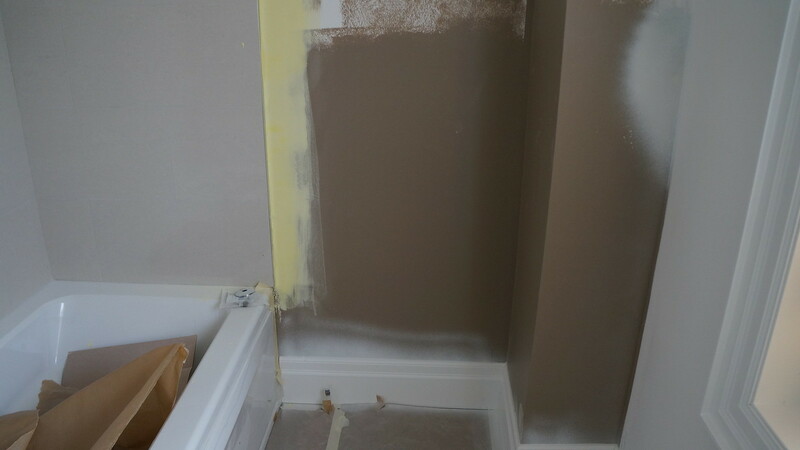 For example, the areas behind the toilets are much easier to paint before the toilet is installed. 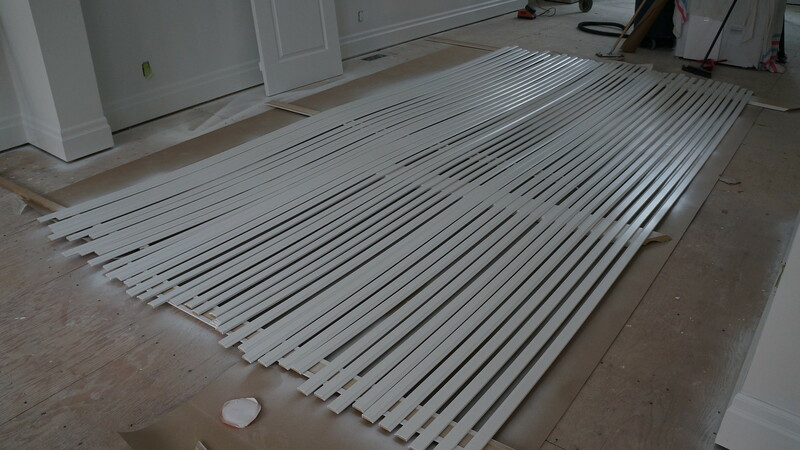 The trim and baseboards are also usually painted before it is installed as well. 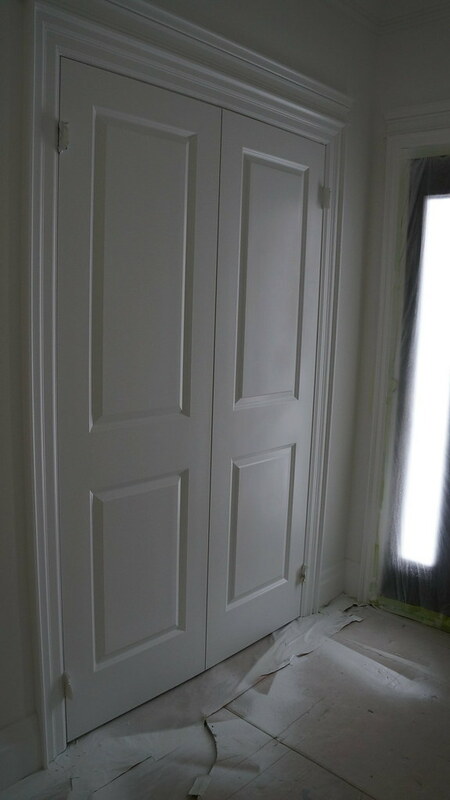 All the interior doors got painted. 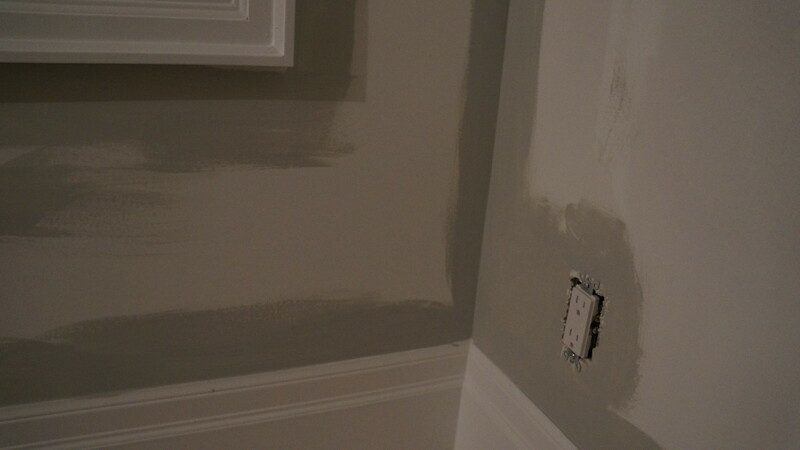 Our painter also went around and ‘cut’ all the corners and edges. This way it’s just rolling, which I find to be much less labour intensive than cutting the edges. 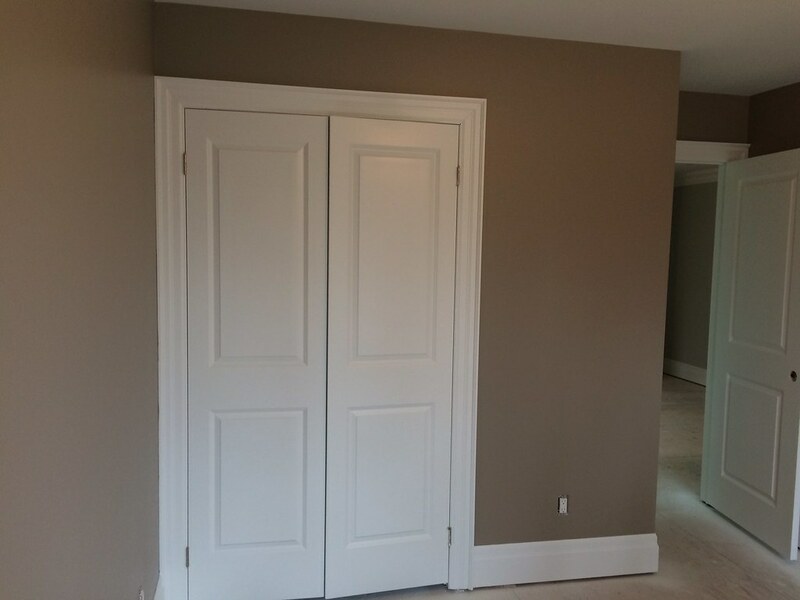 The drywall installers usually go around and look at the mudding and sanding work to make sure it is all smooth and fix anything that is not. Before you paint, you have to clean up all the drywall dust so the dust does not get clumped in the paint as it’s applied. And there is always A LOT of drywall dust. You often have to vacuum and dust a few times, especially since things take time to settle. I spent many weeks debating paint colours. It was a painful experience. Don’t get me wrong, it started off fun, but quickly became tedious when you have to pick SO many different colours. I knew I wanted cooler grey tones, but didn’t want it all to be the same. 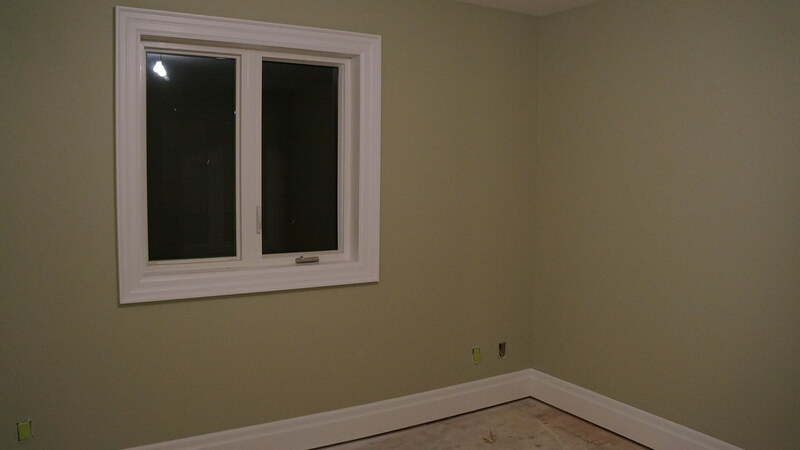 I wanted the guest bedroom to have warmer colours. Nevertheless, we still had a bad choice of colours, although they turned out to be the “IT” colours for 2016. What I thought would be a brown colour, turned out very pink. And what I thought would be nice cool blue, turned out to be a harsh bubblegum blue. Here is the before. Trust me, it was a gross baby puke pink. And here is the after. MUCH better! 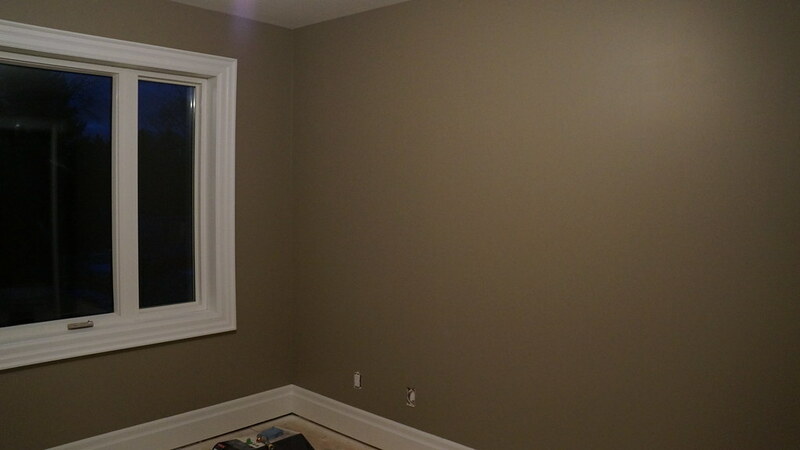 We went with Ashley Grey for the guest bedroom and colour matched the current Skiers Trail by Dulux we have in our condo since we love it so much. 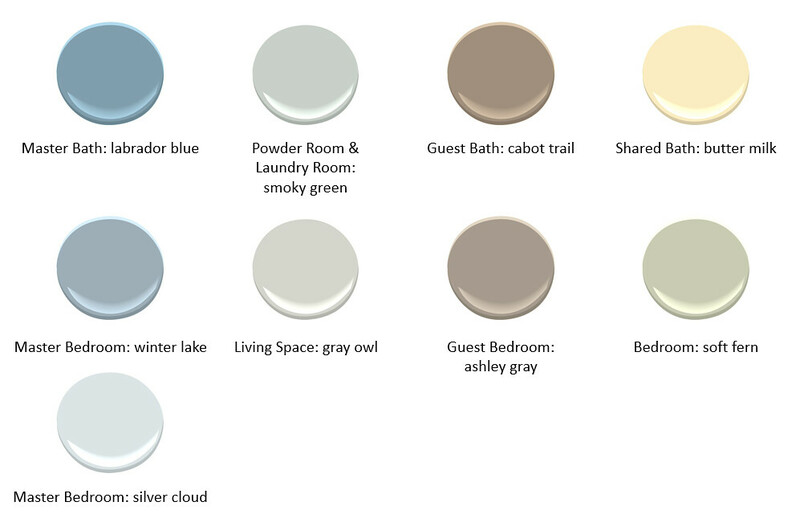 I talked to a friend about paint, somehow she knew 85% of the paint colours by name that I was looking at. I am not sure how I feel about this. She also has at least one of them in her house. This same friend suggested that I search each colour online and read up on the undertones; I found this VERY helpful. I went to a paint store and after picking up about 20 paint chips, I put them all back and asked to buy a paint chip fan deck. I ended up getting two. 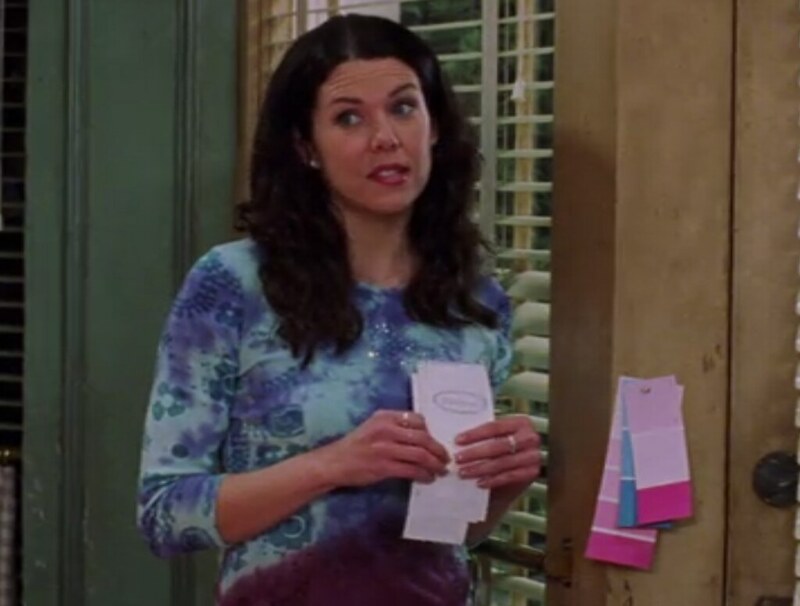 I felt like Lorelai in that scene in Gilmore girls where she is trying to get Luke to paint the diner. To be honest, I wish I put together this below image while I was still picking colours. I think we would have realized earlier that the guest bathroom and bedroom were so similar. Seeing them in real life, when you stand in one room to the other, they look different and complementary. The same goes for the master bedroom, the accent wall with the darker grey with blue tones, transitions really well with the lighter colour. 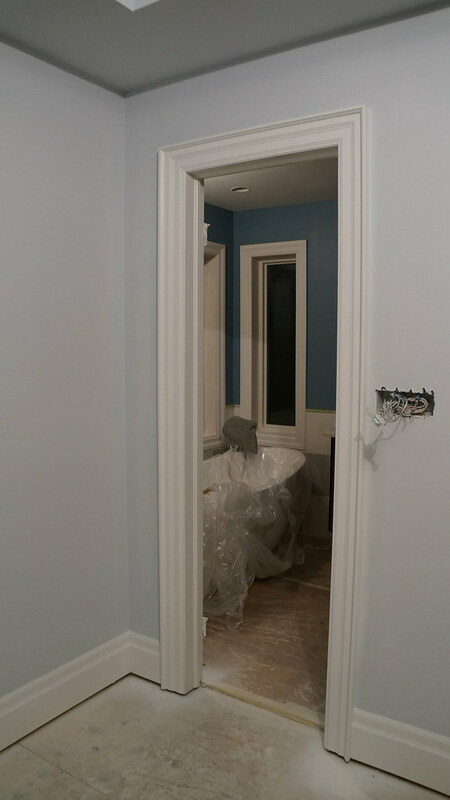 You can also see the colour of the master bath and because it’s a darker, stronger colour with the same blue tones, it adds dimension. 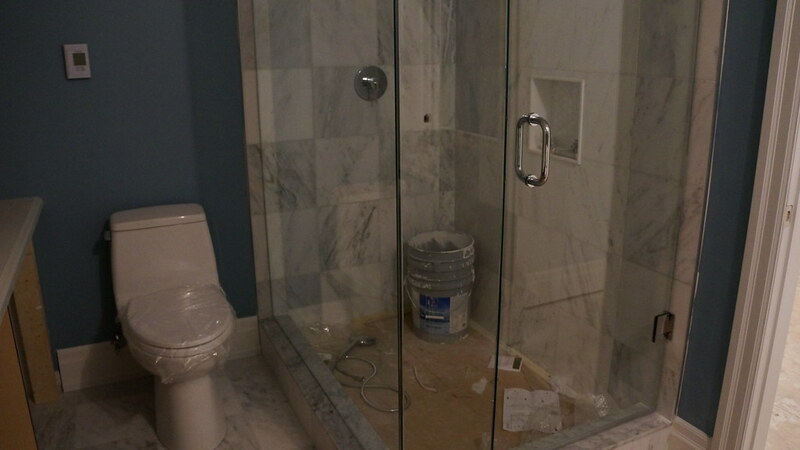 We also got the glass doors installed in our master bathroom for the shower stall. It looks beautiful! 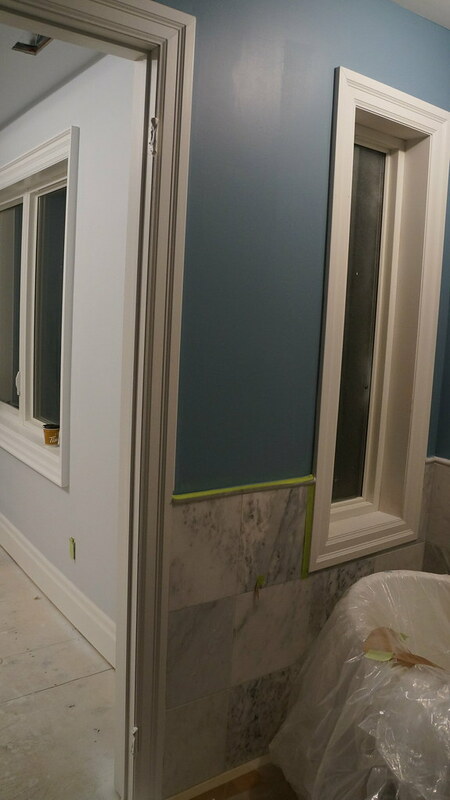 I wanted to mix up from the blues, so I introduced a few greens in one of the bedrooms and in the powder room and in the laundry room. To be honest, I just did not care what colour the laundry room was painted. 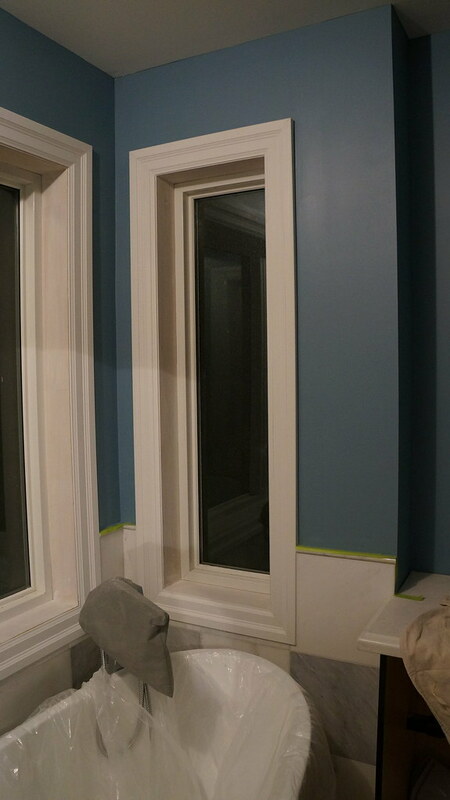 And I didn’t want to pick another paint colour, so we just used leftover paint. Now the living space was a challenge. It is an open layout, and an open to above. I wanted to keep it simple so we decided to use the same colour for the entire ground floor and the hallway outside the bedrooms in the second floor. Grey Owl is perfect for a job like this. It actually looks different depending on the angle and lighting of the room. In some areas it looks green, in other areas it looks blue and grey as well. And this happens at all times of the day. It is a very dynamic colour. Did you figure out the title quote? Here is a hint. I never want to see or talk about another paint sample again.